The question of whether glucose supplementation is required in children during surgery is still under debate. The impact of perioperative glucose supplementation, or its restriction, on their metabolism remains unclear. We discuss the findings of various studies that have addressed this question and the rationale for current recommendations. Cerebral palsy (CP) refers to a spectrum of nonprogressive neurological disorders with disturbances in posture and movement, resulting from perinatal intrauterine insult to developing infant brain. Many conditions associated with CP require surgery. Such cases pose important gastrointestinal, respiratory, and other perioperative considerations. Anesthetic management in these cases is delicate. Intraoperative complications including hypovolemia, hypothermia, muscle spasms, seizures, and delayed recovery might complicate the anesthetic management. A thorough preanesthetic evaluation allows for a better intra- and post-operative care. Postoperative analgesia is important, particularly in orthopedic surgeries one for pain relief. This review highlights the clinical manifestations in CP and anesthetic considerations in such child presenting for various surgeries. Background: Insertion of a nasogastric tube (NGT) in an anesthetized, comatose intubated patient is not always as easy as in a conscious, cooperative patient. Various techniques have been tried with varying success. The aim of this randomized study was to compare and evaluate the two techniques of NGT insertion with the conventional technique of insertion with respect to success rate, time taken for insertion and adverse effects. 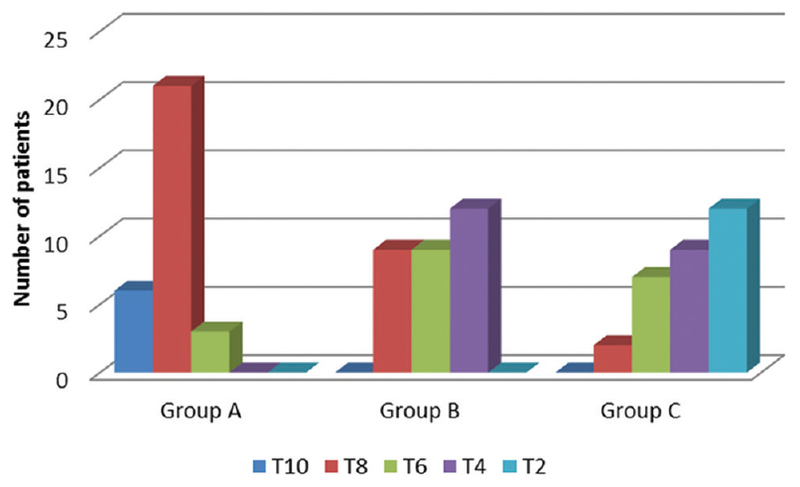 Materials and Methods: Patients admitted for laparoscopic hysterectomy were chosen and then were divided into three equal groups of forty each, by randomized technique. Group C included patients in whom conventional method was used to insert NGT. Group R where reverse Sellick's technique was used. Group F where neck flexion with lateral pressure was used. Results: Both the techniques were better than the conventional method. Among both the techniques, reverse Sellick's technique was the best method but not without adverse effects. The required insertion time was very less and success in the first attempt was more in the group where reverse Sellick's was used. Conclusion: Modified techniques of NGT insertion were better than the conventional method. Further studies after eliminating major limitations are required to really find a superior technique. Background: No drug, used as adjuvant to spinal bupivacaine, has yet been identified that specifically inhibits nociception without its associated side effects. Aim of the Work: The purpose of this study is to compare the efficacy of dexmedetomidine and fentanyl with spinal bupivacaine in inguinal hernioplasty. Patients and Methods: Sixty patients of inguinal hernioplasty were randomly allocated to one of three groups, Group C (n = 20) – the patients received 15 mg hyperbaric bupivacaine + 0.5 ml saline. Group D – (n = 20) the patients received 15 mg hyperbaric bupivacaine + 10 μg dexmedetomidine diluted with 0.5 ml saline. Group F (n = 20) – the patients received 15 mg hyperbaric bupivacaine + 25 μg fentanyl (0.5 ml). Onset, duration of anesthesia, degree of sedation, and side effects were recorded. 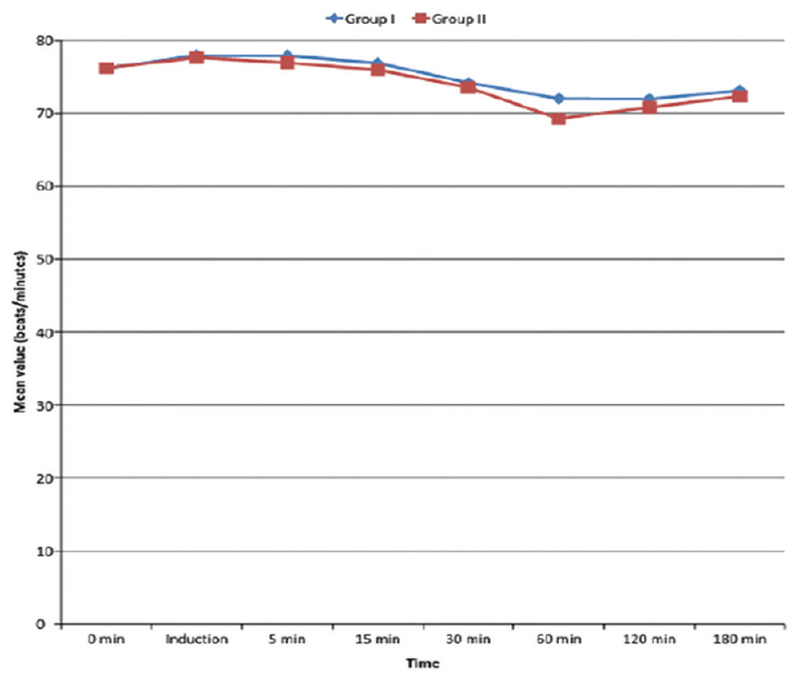 Results: The onset of anesthesia was shorter in Groups D and F as compared with the control Group C, but it was shorter in Group D than in Group F. The duration of sensory and motor block was prolonged in Group D and F as compared with the control Group C, but it was longer in Group D than in Group F. The postoperative analgesic consumption in the first 24 h was lower in Groups D and F than in Group C, and it was lower in Group D than in Group F. Conclusion: Onset of anesthesia is more rapid and duration is longer with less need for postoperative analgesia in patients undergoing inguinal hernioplasty under spinal anesthesia with dexmedetomidine and fentanyl than those with spinal alone with tendency of dexmedetomidine to produce faster onset, longer duration, and less analgesic need than fentanyl with similar safety profile. Introduction: The aim of the present study was to evaluate and compare the effect of clonidine 200 μg and gabapentin 900 mg and pregabalin 150 mg in attenuation of the hemodynamic response to laryngoscopy and intubation in normotensive patients undergoing elective surgery. Methods: Ninety adult patients between 18 and 60 years are enrolled in the study. Patients with American Society of Anesthesiologists Grade-I and Grade-II are included which are posted for elective surgery under general anesthesia. Patients were divided into three groups: A, B, and C and received oral drugs 90 min before induction of general anesthesia, pregabalin 150, gabapentin 900mg, and clonidine 200 μg, respectively. Hemodynamic parameters such as heart rate and blood pressure were noted just before the (basal) administration of the drug, and in operation room, readings were recorded before intubation (T0) and after intubation at 1, 3, 5, and 10 min. Sedation and anxiety score were noted after 1 h of oral administration of the drug. Results: Mean arterial pressure was well attenuated by pregabalin than others, and mean heart rate following laryngoscopy and intubation was attenuated by clonidine group significantly. Conclusion: We conclude that oral pregabalin and gabapentin attenuate blood pressure response fairly well and heart rate significantly attenuated by clonidine. All three drugs are very effective for relieving anxiety and improving sedation. Aims: To evaluate the efficacy of intrathecal isobaric Ropivacaine and its comparison with intrathecal isobaric Bupivacaine in elective inguinal hernia repair surgeries. 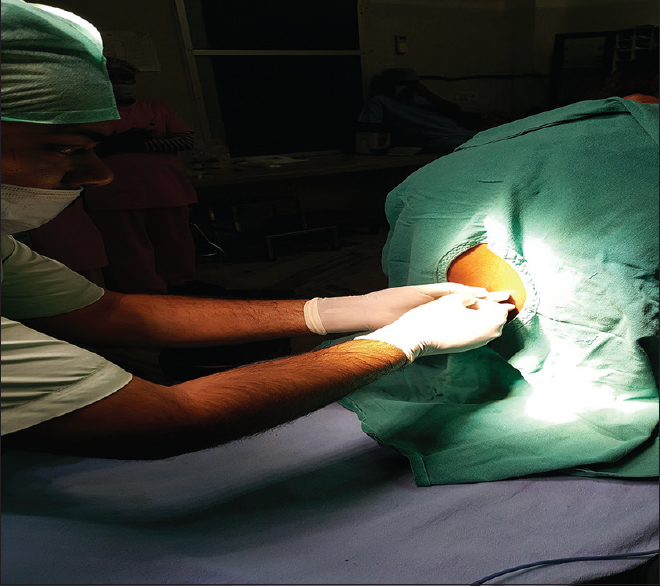 Settings and Design: A prospective, randomized study was conducted in a tertiary care hospital with 80 patients of ASA grade I-III undergoing elective inguinal hernia repair surgery under spinal anaesthesia .Ethical committee clearance and written consent taken. The patients were randomly divided into two equal groups to the Ropivicaine group (Group R) and to theBupivicaine group (Group B). Parameters observed were onset and duration of sensory and motor block, maximum sensory level achieved degree of motor blockade, two segment regression, and haemodynamic changes. Results: The development of sensory block was faster with Isobaric Ropivicaine (12.1 ± 4.9 minutes) as than isobaric Bupivicaine (13.94 ± 4.52 minutes) but the difference was not statistically significant. Onset of Grade III Motor block was longer with Isobaric Ropivicaine (8.51 ± 3.39 minutes) as compared to isobaric Bupivicaine ( 8.51 ± 3.39 minutes), but the difference was not statistically significant. Time of Complete Sensory Regression was significantly shorter with Isobaric Ropivicaine (212.69 ± 27.31 minutes) with statistical significance. Time to complete motor recovery was significantly shorter in Ropivacaine group (253.38 ± 27.13 minutes)as compared to Bupivacaine group (258.55 ± 35.81min), with statistical significance.Time to achieve discharge criteria was relatively shorter with Isobaric Ropivicaine. Haemodynamic Parameters did not differ significantly in both the groups during the entire study period. Conclusion: Intrathecal administration of isobaric Ropivacaine (0.75%) 15 mg provides similar quality of spinal anaesthesia but of significantly shorter duration, maintaining similar hemodynamic stability and discharge criteria without significant adverse effects when compared to isobaric Bupivicaine (0.5%) 10 mg. Aims and Objectives: To evaluate the efficacy of tramadol or dexamethasone as an adjuvant to levobupivacaine in ultrasound-guided supraclavicular brachial plexus block in terms of onset time of complete sensory and motor blockade, duration of motor blockade, duration of analgesia, and any complication. Settings and Design: This was a randomized controlled trial conducted in the Department of Anesthesiology, a tertiary care hospital. Materials and Methods: Sixty consecutive patients of the American Society of Anesthesiologists physical status Class I and II who were posted for upper limb surgeries were recruited. Patients were divided into two groups of thirty patients each. Group T (tramadol) received 20 ml of 0.5% levobupivacaine with 100 mg tramadol, and Group D (dexamethasone) received 20 ml of 0.5% levobupivacaine with 8 mg dexamethasone under ultrasound guidance. Sensory and motor block assessment was done every 2 min until the development of complete sensory and motor block till 45 min. Verbal numerical rating scale score was assessed in postoperative ward at regular intervals. Patients were followed up to check for any residual neurological deficits. Results: There was no statistical difference in demographic data between the two groups. The onset time of sensory and motor blockade shows no significant difference between groups. The mean time duration of motor blockade in Group T was 764.63 min and for Group D was 1150.27 min which was statistically significant (P < 0.05). The duration of analgesia in Group D was 1300.83 min and in Group T was 820.47 min which was statistically significant (P < 0.05). Side effects such as nausea, vomiting, pruritis, hypoxemia, and long-term neurological deficits were not reported in any of the patients in either group. Conclusion: Dexamethasone 8 mg as an adjuvant to 0.5% levobupivacaine for supraclavicular brachial plexus block using ultrasound guidance increases the duration of analgesia in comparison to 100 mg tramadol and provides excellent postoperative pain-free period without any neurological deficits. Background: Long-acting local anesthetics are used in subarachnoid block to increase the duration of anesthesia. Adjuvants are added to improve the duration of analgesia. Settings: Randomized controlled trial was conducted in the Department of Anesthesiology in a tertiary care hospital.Aims and Objectives: The objective of this study was to evaluate the efficacy of low-dose tramadol as an intrathecal adjuvant to levobupivacaine in terms of duration of analgesia, onset of sensory blockade, onset of motor blockade, and duration of motor blockade. Methodology: After obtaining the Institutional Ethics Committee approval and informed consent, sixty patients posted for infraumbilical surgeries were recruited. Randomization was done using a sealed envelope technique. Patients were divided into two groups: LT received 3 ml of 0.5% isobaric levobupivacaine with tramadol 10 mg (0.2 ml) and LS received 3 ml of 0.5% isobaric levobupivacaine with 0.2 ml of normal saline. Duration of analgesia, onset of sensory blockade, and onset and duration of motor blockade were recorded. Results: There was no statistical difference in demographic data between the two groups. The mean onset time of sensory blockade in Group LS was 12.7 ± 9.81 min and for Group LT was 12.9 ± 0.81 min, which was not statistically significant between two groups (P = 0.93). The mean onset time of motor blockade in Group LS was 13.4 ± 10 min and for Group LT was 14.4 ± 10 min, which was no statistically significant between the two groups (P = 0.71). 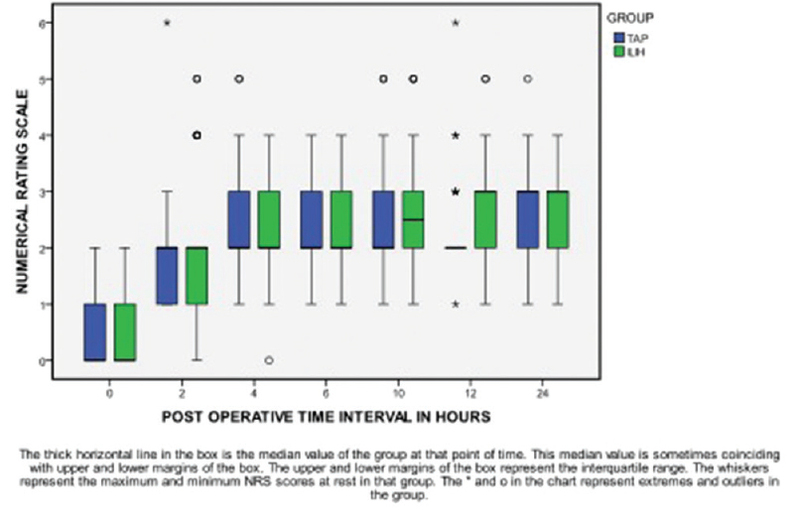 The mean time duration of analgesia in Group LS was 170.3 ± 59 min and for LT was 198.9 ± 57.33 min. There was mild prolongation of analgesia in Group LT, but it was not statistically significant (P = 0.0615). 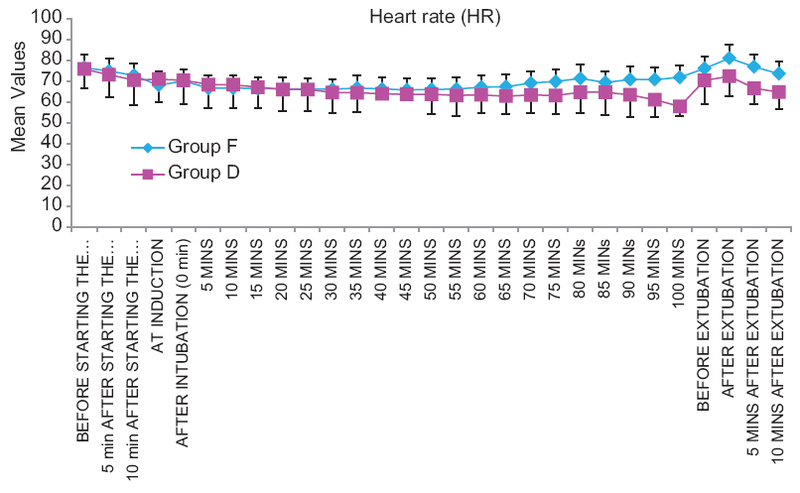 The mean duration of motor blockade in Group LS was 170.23 ± 58 min and Group LT was 190.76 ± 4 min, which was not statistically significant between the two groups (P = 0.14). Conclusion: Low-dose tramadol as an adjuvant to isobaric intrathecal levobupivacaine does not prolong analgesia significantly. Background and Objectives: Supraglottic airway devices (SADs) have revolutionized the pediatric anesthetic practice and got a key role in difficult airway (DA) management. Several modifications of SADs design had come up to improve their safety. Aim: The aim of this survey was to determine the current usage of SADs in pediatric anesthetic practice, their availability, and to know any difficulties noted in practice. Methods: It was a questionnaire survey among the anesthesiologists who attended the National Pediatric Anesthesia Conference-2016. The questionnaire assessed the current practice preferences of SADs in routine pediatric cases and DA management, availability of various devices, and any difficulties noted in their usage. Results: First-generation SADs were widely available (97%), and 64% of respondents preferred to use it for pediatric short cases. 64% felt the use of SADs free their hands from holding the facemask and 58% found better airway maintenance with it. Intraoperative displacement (55%) was the common problem reported and only 11% felt aspiration as a problem. Most of the respondents (73%) accepted its use as rescue device in airway emergency, and 84% felt the need of further randomized controlled studies on safety of SADs in children. The majority were not confident to use SADs in neonates. Interpretation and Conclusions: The key role of SADs in DA management was well accepted, and aspiration was not a major problem with the use of SADs. Although many newer versions of SADs are available, classic laryngeal mask remains the preferred SAD for the current practitioner. Further, RCTs to ensure the safety of SADs in children are warranted. 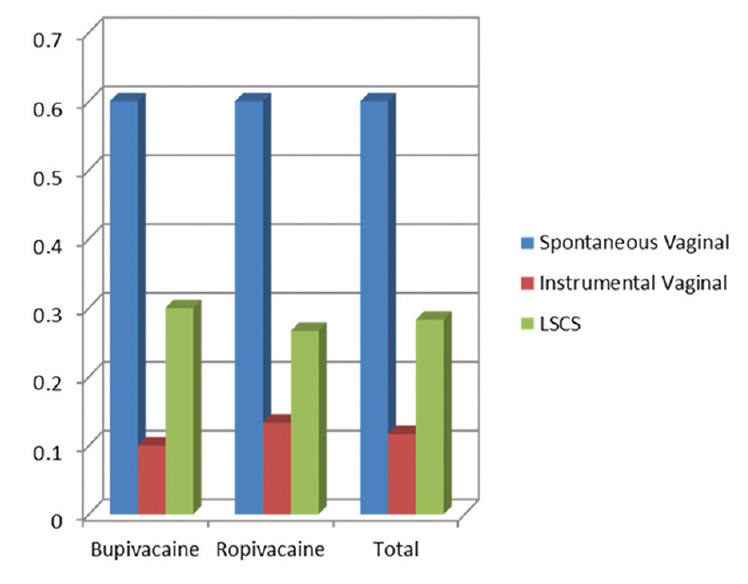 Background and Aims: This study aims to compare the minimum effective concentration of local anesthetic (LA) bupivacaine and ropivacaine with highly lipid soluble opioids fentanyl for providing optimal labor epidural analgesia. Settings and Design: The objective of this study was to evaluate the efficacy of racemic bupivacaine 0.0625% and 0.1% of ropivacaine both mixed with 2 μg/ml of fentanyl for epidural labor analgesia in parturients with spontaneous labor and normal fetal heart rate tracing. Methodology: Sixty parturients requesting for labor analgesia were divided into two groups. Group B (n = 30) received racemic bupivacaine (0.0625%) and fentanyl 2 μg/ml of 10 ml and Group R (n = 30) received ropivacaine (0.1%) and fentanyl 2 μg/ml. 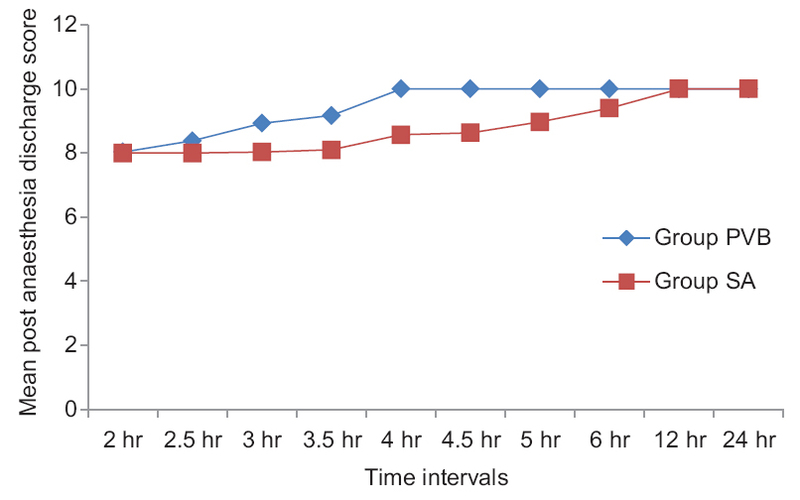 In both groups, the drug was given in 5 ml fractionated doses at 5 min interval. 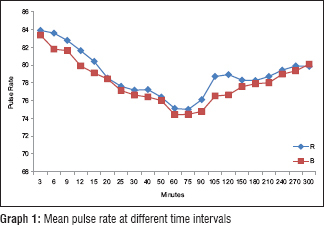 Parturients not experiencing analgesia within 15 min of initial bolus were supplemented with additional 5 ml of the same concentration of the solution. Epidural analgesia was maintained by timed top ups at the end of 90 min with the dosage equal to the initial dose of the drug. Duration of labor analgesia, motor block, visual analog scale, maternal hemodynamic parameters, mode of delivery, and maternal satisfaction was assessed. Statistical Analysis: Data were analyzed with odds variance, unpaired t-test, and Chi-square tests. P < 0.05 was considered statistically significant. Results: In our study, results indicate that both drugs were equally effective clinically. Maternal demographic characteristics were comparable. There were no statistically significant differences in visual analog pain score, highest sensory block, maternal satisfaction, mode of delivery, total dose of LAs during labor and motor block at delivery between the groups. Conclusions: In our study, both the drugs produced equivalent analgesia for labor at low concentration when used with highly lipid soluble opioid such as fentanyl. Background: Many studies are there using adjuvants such as clonidine and fentanyl with bupivacaine in the subarachnoid block for prolonging postoperative analgesia. However, literature is divided regarding the dosage and efficacy of both intrathecal adjuvants. Furthermore, these adjuvants have their own side effects. Hence, search for ideal intrathecal adjuvant between clonidine and fentanyl to bupivacaine goes on. Aim: The aim of the present study was to compare the effect of intrathecal clonidine and fentanyl as adjuvant to bupivacaine in the subarachnoid block for lower limb orthopedic surgery. Materials and Methods: It was a prospective randomized study in which eighty patients posted for lower limb orthopedic surgery were divided into two groups of forty each. Group C – Received intrathecal hyperbaric bupivacaine (2.5 ml) +50 μg clonidine (diluted to 0.5 ml). Group F – Received intrathecal hyperbaric bupivacaine (2.5 ml) + fentanyl 25 μg (diluted to 0.5 ml). Duration of postoperative analgesia, sensory and motor block characteristics, hemodynamic parameters, and side effects were recorded and analyzed. 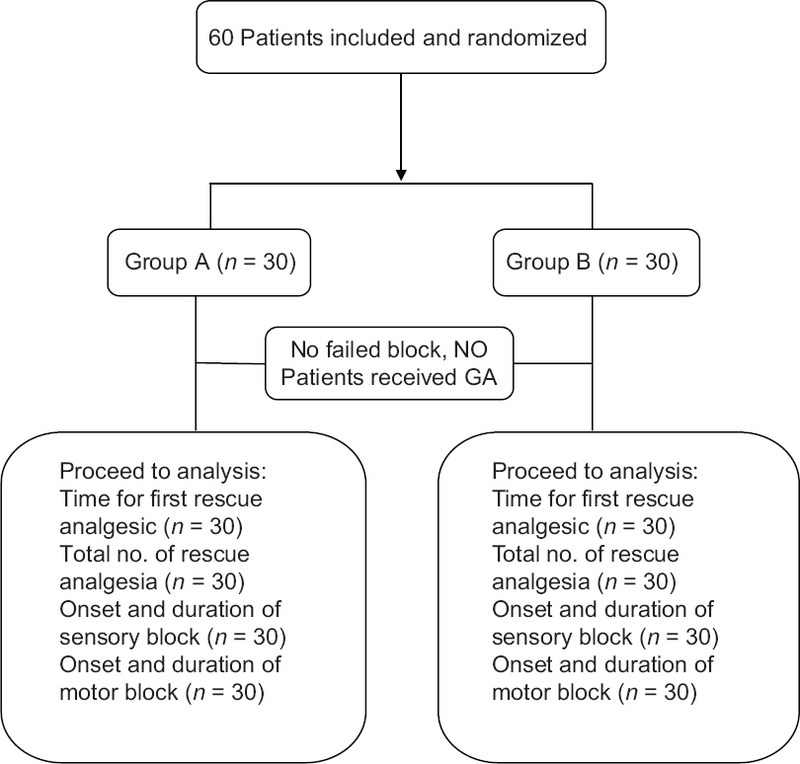 Results: Time for first dose of rescue analgesic was delayed in Group C (510.84 ± 24.10 min) in comparison to Group F (434.95 ± 19.16 min) which was statistically significant (P < 0.001). Duration of sensory and motor block was significantly prolonged in Group C compared to Group F (P < 0.001). Sedation was more in Group C than Group F (P < 0.001). Other block characteristics, hemodynamic, and side effects were comparable in both groups. Conclusion: Intrathecal clonidine as adjuvant to hyperbaric bupivacaine provided prolonged postoperative analgesia with more sedation in comparison to intrathecal fentanyl. Background: Effective pain relief therapy after caesarean section is essential for the parturient's comfort and early ambulation. Paracetamol has an excellent safety profile when compared to opioids. Aim: To assess and evaluate the effect of oral, rectal, and intravenous infusion of paracetamol for post-operative analgesia in women undergoing caesarean section under spinal anaesthesia. Settings and Design: We conducted a prospective, randomized controlled study (18-35 years of age) of the ASA- I and II parturient scheduled for lower segment caesarean section were included. Methods and Materials: They were randomly allocated to 3 groups of 50 each. Group A received oral paracetamol tablet 650mg (1 tablet) 20min before shifting to operation room, group B received rectal paracetamol suppository 35-45 mg/kg immediately after spinal anaesthesia and group C received i.v. paracetamol infusion of 10-15mg/kg over 15min duration 20min before finishing the operation. Duration of analgesia was evaluated as primary outcome and other parameters as secondary outcome. Statistical Tests: All statistical analyses were performed using the SPSS statistical package 17.0 version. Results were analyzed using Chi Square test for non-parametric data and ANOVA for parametric data. P value of less than 0.05 was considered significant and less than 0.001 as highly significant. Results: Duration of analgesia was significantly longer in group B as compared to group A and C. The requirement of supplemental rescue analgesia was also lower in group B compared to group A and C. No significant haemodynamic derangements and adverse effects were noted among all the three groups. Conclusion: Paracetamol when given rectally improves the quality and duration of postoperative analgesia to a greater extent as compared to oral and intravenous route of paracetamol without any side effects. Background: Peripheral neural blockade provides effective analgesia with potentially less side effects than an epidural blockade. The present study was undertaken to compare continuous femoral nerve blockade (CFNB) with continuous epidural analgesia (CEA) for postoperative pain control in knee surgeries. Materials and Methods: The patients belonging to the American Society of Anesthesiologists Class I and II scheduled for various knee surgeries under spinal anesthesia were enrolled in this study. They were randomly divided into two equal groups of thirty patients each. The Group I patients received CFNB and in the Group II patients epidural catheter was placed preoperatively. Postoperatively, continuous infusion with 0.0625% bupivacaine and fentanyl 2 μg/ml started at 5 ml/h for 72 h in both the groups. 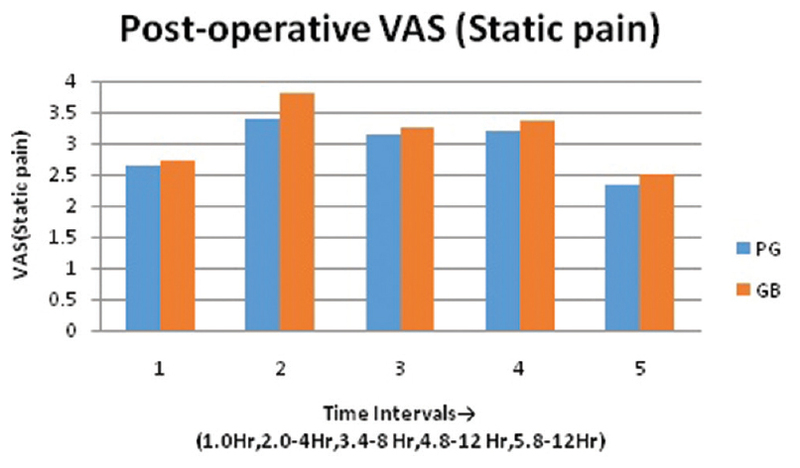 Data on Visual Analog Scale (VAS) pain scores, hemodynamic changes, side effects at 0, 1, 6, 12, 24, 36, 48, 60, and 72 h and requirement of analgesic doses for the first 24 h of the surgery were noted. Results: In both the groups, pain was well controlled, mean VAS of pain were 0.2, 0.6, 2.47, 2.07, 2.73, 1.5, 1.43, 1.37, and 1.3 for femoral and 0.13, 0.93, 2.57, 2.17, 2.33, 1.6, 1.43, 1.30, and 1.33 for epidural group during 0, 1, 6, 12, 24, 36, 48, 60, and 72 h which was not statistically significant. Hemodynamics were stable throughout in both the groups. The patients in CEA had more incidences of pruritus and urinary retention. Conclusion: CFNB provides postoperative analgesia equivalent to that obtained with a CEA but with fewer side effects. Background and Objectives: Functional endoscopic sinus surgery (FESS) being a delicate technique, intraoperative bleeding is one of the major challenges. Even a little bleeding can adversely affect the surgeon's ability to visualize the region to be operated. General anesthesia is preferred over topical anesthesia in FESS. This study was conducted to compare the surgical field using total intravenous anesthesia (TIVA) with propofol and inhalational anesthesia with isoflurane for FESS. Secondary outcomes such as intraoperative blood loss and the incidence of perioperative complications were also recorded. Subjects and Methods: A total of sixty patients in the age group of 16–60 years with physical status American Society of Anesthesiologists Classes I and II, undergoing FESS were randomly divided into two groups of thirty each after taking informed consent and approval from the Hospital Ethics Committee. Thirty patients in Group I: received isoflurane-based inhalational anesthesia and other Thirty patients in Group II: were administered TIVA with propofol. Various parameters were recorded and statistically analyzed. Results: There was improved quality of surgical field at the end of surgery in the Group II as compared to Group I. Total blood loss during surgery and incidence of intraoperative complications were less in Group II as compared to Group I. Conclusion: This study concludes that in FESS, using TIVA with propofol decreases blood loss and the incidence of complications during surgery in addition to providing good quality of surgical field. Background and Aim: Recent studies have advised narcotic less anaestheic techniques for breast cancer surgeries due to altered immune system by use of opioids. So we planned this study to compare the efficacy of dexmedtomidine with fentanyl in breast cancer surgery in terms of haemodynamic stability, anaesthetic sparing effects, recovery profile and postoperative analgesia. Material and Methods: In this randomized prospective controlled trial, a total of 60 female patients were randomly assigned into two groups. Patients in group F (n = 30) received a loading dose of fentanyl 2 μg/kg with maintenance dose of 0.5 μg/kg/h and in group D (n = 30) received dexmedetomidine 1 μg/kg as loading dose with maintenance dose of 0.25 μg/kg/h till the end of surgery. Hemodynamic parameters, desflurane requirement, recovery profile and postoperative analgesia were monitored and compared in both the groups. Results: Mean HR was less in group D compared to group F intraoperatively, before and after extubation with a significant p value. The mean MAP was also lower in group D compared to group F at all the time points. MAC requirements were found lower in group D compared to group F with a significant P < 0.001. Cognitive recovery in the form of time to respond to verbal commands, time to extubation, time to orientation was early in dexmedetomidine group. Conclusion: Dexmedtomidine can be used as suitable alternative to fentanyl in breast cancer surgeries due to better hemodynamic stability, anaesthetic sparing effects and better recovery profile. Background: The most commonly used drug for total intravenous anesthesia (TIVA) is ketamine which results in cardiovascular stimulation. Aims: The primary aim of this study was to assess the effect of oral clonidine premedication on attenuating the hemodynamic responses following ketamine administration. Settings and Designs: This was a prospective, observational, comparative study conducted in a tertiary care institution. Subjects and Methods: A total of 40 female patients aged 18–55 years who were posted for elective short gynecological procedures under TIVA were recruited for this study. Group A patients were given oral clonidine 150 μg 60 min before proposed surgical procedure, whereas Group B patients received a placebo tablet. Before induction, all patients received glycopyrrolate 0.2 mg, midazolam 2 mg, and fentanyl 2 μg/kg intravenously. Anesthesia was induced with ketamine 1.5 mg/kg body weight intravenously over 2–3 min. The hemodynamics after premedication and induction were assessed. Statistical Analysis Used: To test the statistical significance or difference between the mean change from the basal value at various time points, student's t-test was applied. 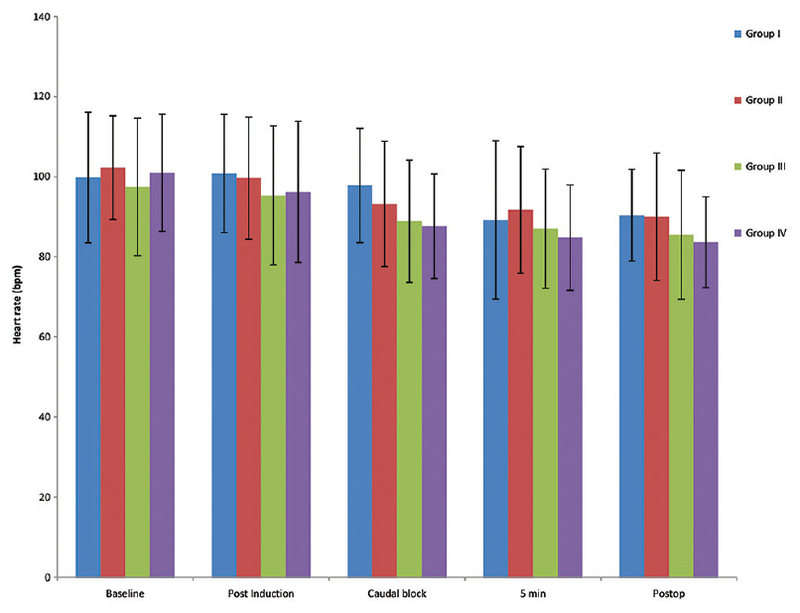 Results: At 20, 30, 40, 50, and 60 min postpremedication and after induction at 1, 3, 5, 10, 15, 20, and 30 min, Group B showed significantly higher heart rate. Systolic and diastolic blood pressures showed a significant decrease in Group A after induction up to 30 min. Nearly 6.7% of the patients in Group B had emergence delirium with none in Group A, which was not statistically significant. Conclusion: Oral premedication with clonidine 150 μg, administered 60 min before the conduct of TIVA, attenuated hemodynamic responses of intravenous ketamine. Background: Spinal anesthesia is used commonly intraoperatively. However, local anesthetics are associated with relatively short duration of action. A number of adjuvants have been used to prolong the postoperative analgesia. Objectives: To compare efficacy of dexmedetomidine and fentanyl when given intrathecally as an adjuvant to 2.5 ml of 0.75% isobaric ropivacaine. Materials and Methods: Sixty selected patients were randomized to receive 2.5 ml of 0.75% isobaric ropivacaine with dexmedetomidine 5 mcg (Group RD) or 20 mcg of fentanyl (Group RF) intrathecally for lower limb surgeries, block characteristics, hemodynamic changes, and adverse effects were compared. Results: Efficacy of both the drugs when given intrathecally was studied. Mean time needed for sensory blockade at T10 was 156.4667 ± 33.78 s in Group RD and 185.2000 ± 35.17 s in Group RF. The results are clinically and statistically significant (P - 0.002). The mean of total duration of sensory block in Group RD was 194.400 min while it was 139.9000 min in Group RF which was clinically and statistically significant (P - 0.0001). 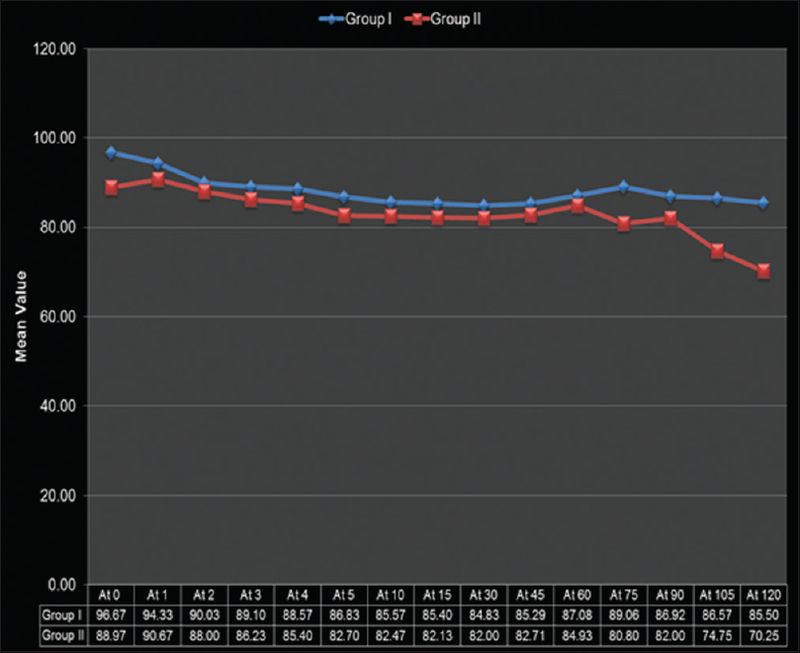 Time taken for onset of motor block was almost same in both groups. The mean of total duration of motor block in Group RD was 136.7333 min while it was 94.8667 min in Group RF which was clinically and statistically significant (P - 0.000). Conclusion: Dexmedetomidine at a dose of 5 μg added to 2.5 ml of ropivacaine provided earlier sensory blockade, prolonged duration of sensory and motor blockade for patients under intrathecal anesthesia for lower limb surgeries with no sedation. Background: Spinal anesthesia is a safe alternative to general anesthesia and often the anesthetic technique of choice in many lower abdominal and lower limb surgeries in children. As the vertebral column and spinal cord grows variedly with age and not weight, we planned to administer an age-based dosing schedule of hyperbaric bupivacaine in the intra-thecal space in select infra umbilical surgeries in children. The aim was to find out the efficacy and complications associated with this dosage. 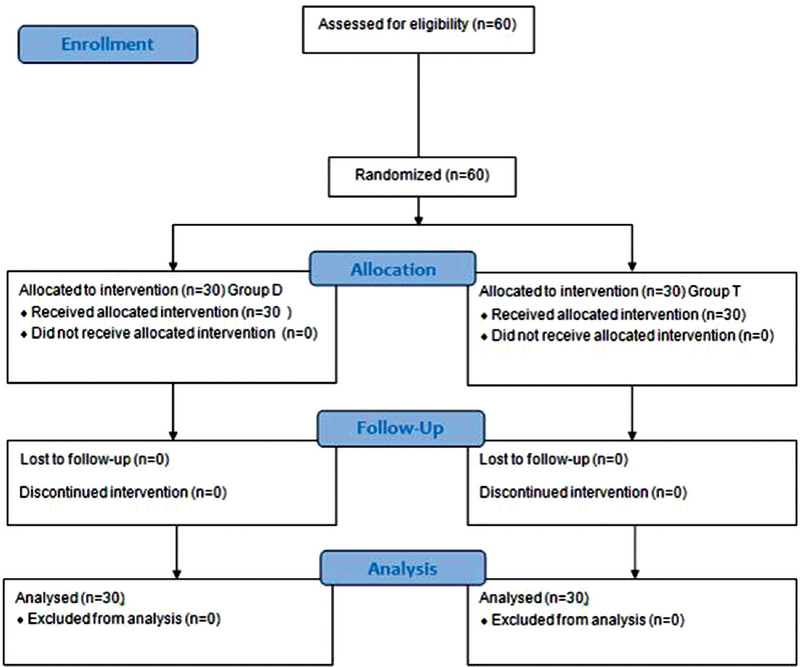 Methodology: Twenty-five pediatric patients between 2 and 12 years, posted for elective infra umbilical surgeries were given a sedation as a combination of effective doses of pentazocine, midazolam, and atropine. In all those patients, spinal anesthesia was administered at a dose of age/5 of hyperbaric bupivacaine. The number of attempts, the onset of blockade, the mean sensory level, and the duration of anesthesia were noted. Any other complications were also noted. Results: The mean and standard deviation of age is 7.68 ± 2.49 years. Intra-thecal anesthesia was administered successfully in the first attempt in 88% of cases whereas the remaining needed the second attempt. Three patients needed intravenous ketamine of 0.25 mg/kg additionally for preoperative sedation. The sensory level was between T6 and T10 with a mean of T8.5. There were no intra-operative complications. In all patients, surgery was finished within the duration of anesthesia of approximately 60 min. There was no conversion to general anesthesia in any case, but a three patients required dose of 0.25 mg/kg of intravenous ketamine as a calming dose. Conclusion: Administration of age-based local anesthetic dosing of hyperbaric bupivacaine in the intra-thecal space by utilizing a new formula of age/5 (Partha formula) is successful in a pilot study in Indian children for infra-umbilical surgeries. There were no observed complications. 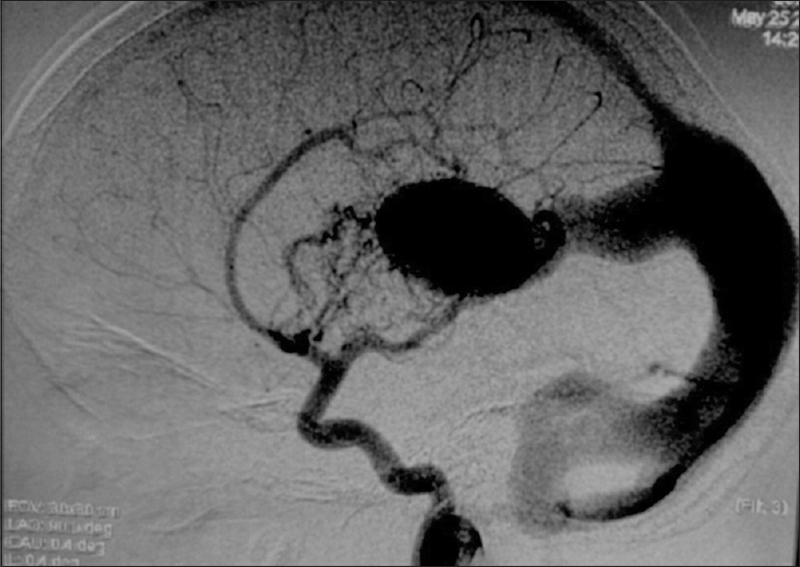 Context: The vein of Galen aneurysmal malformation (VGAM) is a rare arteriovenous malformation where a dilated median prosencephalic vein provides a low-resistance conduit for intracerebral blood flow resulting in high-output cardiac failure, severe pulmonary hypertension, with or without central nervous system symptoms secondary to hydrocephalus, in the neonatal and pediatric population. Aim: This study aims to analysis of the anesthetic management of this unique subset of patients with VGAM. Settings and Design: This was a retrospective analysis of case series of VGAM patients admitted between January 2005 and June 2016 in our Institute. Subjects and Methods: Case records of VGAM patients were reviewed for the anesthetic technique and medications administered. The incidence of intra-and post-procedural complications and their management and outcomes were analyzed. Statistical Analysis: Parametric data were expressed as mean and standard deviation. Descriptive statistics was used for describing associated pathologies, drugs and monitors used during the procedure, incidence of any adverse events, and the treatment protocol. Results: Twenty-one patients underwent treatment for the VGAM. There were a total of forty anesthetics administered for embolization, diagnostic angiography, and magnetic resonance imaging. Eighty-five percent had increased head circumference, 40% had associated focal neurological deficits, and 15% had seizures as presenting symptoms. Cardiac anomalies were seen in 41% of the patients, and difficult airway was anticipated in 38% of the patients. The majority of the patients had inhalational induction (62.2%) and inhalation maintenance (84.4%) of anesthesia. Intraprocedural adverse events were noted in 43% and postprocedure complications in 38% of the patients. Conclusion: Anesthetic management for embolization of VGAM with a combination of opioids and inhalational agents helps in minimizing the incidence of intraprocedural adverse events and provides a better hemodynamic profile. Background: Desirable adjuvants to caudal ropivacaine are the one which prolongs analgesia and free of side effects. We compared nonopioid drugs dexmedetomidine, dexamethasone, and magnesium as adjuvants to ropivacaine caudal analgesia in pediatric patients undergoing infraumbilical surgeries. Materials and Methods: This study was done on 128 pediatric patients (3–12-year olds) undergoing infraumbilical surgeries; they were randomly allocated to four groups to receive normal saline, dexmedetomidine 1 μg/kg, dexamethasone 0.1 mg/kg, and magnesium sulfate 50 mg with injection ropivacaine 0.2% in the dose 0.5 ml/kg caudally. Modified Objective Pain Score and Ramsay Sedation Score, duration of analgesia, hemodynamic changes, and side effects were assessed. ANOVA test was used for numerical values as data were expressed in mean and standard deviation. Kruskal–Wallis test was used for postoperative pain and sedation score as data were expressed as median and range. Results: The demographic data and hemodynamics were comparable. There was a significant prolongation of duration of analgesia in all study groups, dexmedetomidine (406.2 ± 45.5 min), dexamethasone (450.0 ± 72.6 min), and magnesium (325.0 ± 45.8 min) as compared to ropivacaine (285.9 ± 52.7 min) group. None of the adjuvants resulted in either excess or prolonged sedation. No side effects were encountered. Conclusion: The adjuvants dexmedetomidine, dexamethasone, and magnesium added to ropivacaine prolong caudal analgesic duration without any sedation or side effect. Background: Hypobaric spinal anesthesia is advantageous for unilateral lower extremity fractures as it obviates pain of lying on fractured limb for performing subarachnoid block. Aims: This study compares block characteristics and complications of three different baricities of constant dose intrathecal hypobaric levobupivacaine to determine an optimum baricity. 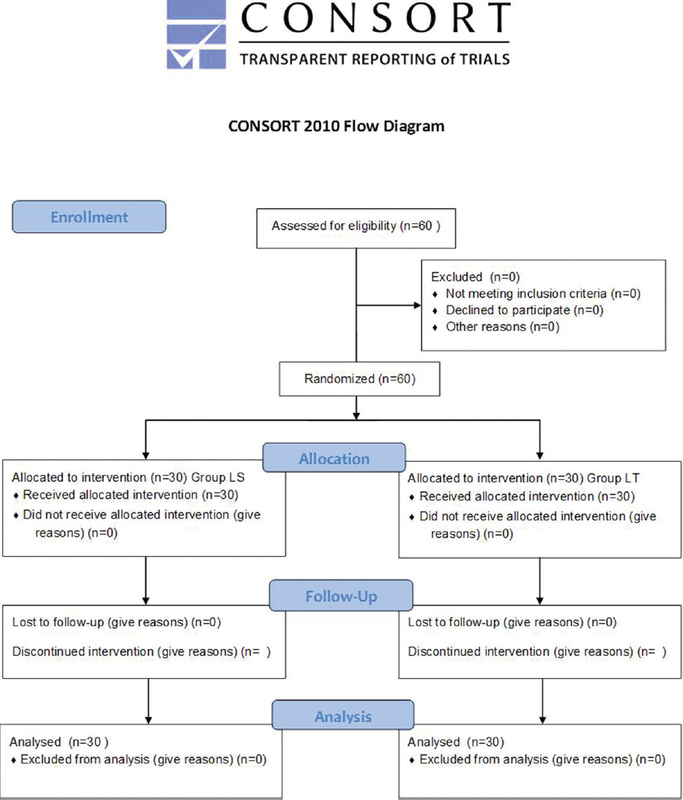 Settings and Design: One-twenty American Society of Anesthesiologists Physical Status 1 and 2 patients aged 18–65 years undergoing unilateral lower limb surgeries were divided into three equal groups for this prospective cohort study. 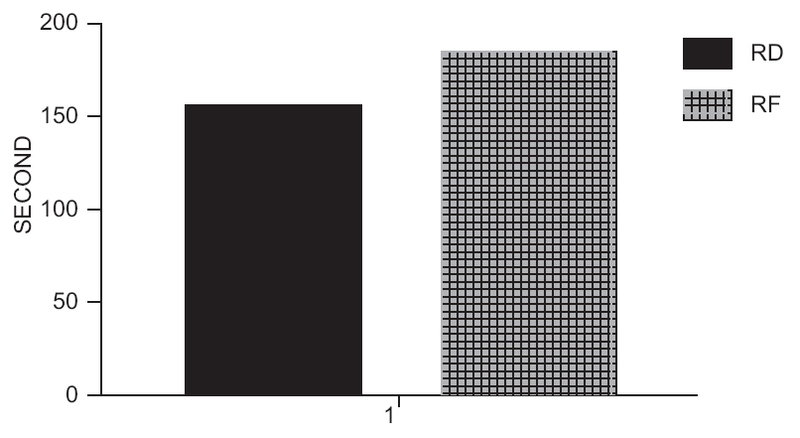 Materials and Methods: To 2 mL intrathecal 0.5% isobaric levobupivacaine (10 mg), 0.4 mL, 0.6 mL, and 0.8 mL of distilled water were added in Groups A, B, and C, respectively. Baricities of Groups A, B, and C are 0.999294, 0.998945, and 0.998806, respectively. Development of sensory and motor block was assessed by the pinprick method and Bromage scale, respectively. The total duration of analgesia and complications were noted. Statistical Analysis Used: Mean, standard error, one-way ANOVA, and Bonferroni were used to analyze quantitative variables; proportions and Chi-square tests for qualitative variables. Results: Demographic parameters, motor block of operated limb, and complications were comparable. Group C had the fastest onset of sensory block (10.10 min) and maximum duration of analgesia (478.97 min; P < 0.001); but high sensory levels in 48.7%. Group B had T10sensory level in 92.5%; onset comparable to Group C (P = 0.248), and reasonable duration of analgesia (332.50 min). Group A had inadequate sensory levels, slow onset, and early regression. Conclusions: Group B (baricity - 0.998945) has better block characteristics among three groups compared. Background: Although the advantages of ventilation with i-gel™ and laryngeal mask airway Supreme (LMA-Supreme™) has been well documented, they are still under debate for surgeries requiring flexion and extension of neck such as thyroid surgery, tonsillectomy, and neck exploration. Hence, we conducted a study to demonstrate the effect of neck flexion and extension in spontaneously breathing anesthetized pediatric patients utilizing i-gel™ and LMA-Supreme™. Methods: A prospective, randomized comparative study was conducted on sixty children, thirty each in i-gel™ and LMA-Supreme™ group. Oropharyngeal leak pressure (OPLP), fiberoptic view of vocal cords, and exhaled tidal volume were evaluated in neutral, flexion, and extension neck positions in spontaneously breathing children. Results: OPLP for i-gel™ was found to be significantly higher in flexion (29.00 ± 1.95 cmH2O, P < 0.001) and lower in extension (21.07 ± 2.08 cmH2O, P < 0.001) as compared to neutral (24.67 ± 2.08 cmH2O). Similar results were observed for LMA-Supreme™ which showed significantly higher OPLP in flexion (24.73 ± 2.26, P < 0.001 respectively) and lower in extension (18.67 ± 1.42 cmH2O, P < 0.001) as compared to neutral (20.87 ± 1.80 cmH2O). Worsening of fiberoptic view occurs for i-gel™ and LMA-Supreme™ in flexion (10/12/5/3/0 and 11/14/2/2/1, P < 0.05) as compared to neutral position (17/10/2/1/0 and 15/12/1/1/1), respectively. Significant change did not occur in extension. Ventilation worsening occurred in flexion as compared to neutral position evidenced by significant decrease in exhaled tidal volume (92.90 ± 11.42 and 94.13 ± 7.75 ml, P < 0.05) as compared to neutral (100.23 ± 12.31 and 101.50 ± 8.26 ml) for i-gel™ and LMA-Supreme™, respectively. Conclusion: Neck flexion caused a significant increase in leak pressure in both i-gel™ and LMA-Supreme™. With deterioration of fiberoptic view and ventilation, both devices should be used cautiously in pediatric patients in extreme flexion. Background: Epidural labor analgesia has not been fully accepted despite many advantages. Many times, the pregnant females reach hospital without antenatal checkup, and at that time, “episiotomy infiltration” becomes an ideal method for vaginal delivery. One of the most important problems after episiotomy is the severe perineal pain on the 1st day of postpartum period. Objectives: We compared the efficacy of clonidine 1 μg/kg as an adjuvant to 20 mg/ml lignocaine infiltration along the line of episiotomy incision for prolonging the duration and quality of analgesia with respect to various activities by single injection. Methodology: Majority of the patients, 94.2% in our study, had no idea about labor analgesia, and only 2.5% of all the patients expressed their interest to deliver without suffering from labor pains. One hundred and twenty pregnant female patients scheduled for full-term vaginal delivery were assigned into lignocaine and lignocaine-clonidine group according to infiltration they received. Pain scoring using visual analog scale and maternal satisfaction scale was monitored. At the end of the research project, the data were compiled and analyzed using appropriate statistical tests. Results: Duration of analgesia after episiotomy during sitting, walking, and squatting was 22.7 ± 1.32, 21.73 ± 1.47, and 19.875 ± 1.48 h in clonidine + lignocaine group and 6.06 ± 1.26, 5.33 ± 1.18, and 4.01 ± 1.28 h in lignocaine only group, respectively, which was highly statistically significant P < 0001. Conclusions: Clonidine when added to 2% lignocaine infiltration in episiotomy improves the quality and significantly enhances the duration of analgesia. Background: Many adjuvants have been used with local anesthetics to reduce the time of onset and prolong the duration of analgesia in brachial plexus blocks. However, few studies are there using verapamil as an adjuvant with levobupivacaine. Aims: This study aims to study the effects of verapamil as adjuvant to levobupivacaine in supraclavicular block for upper extremity surgery. 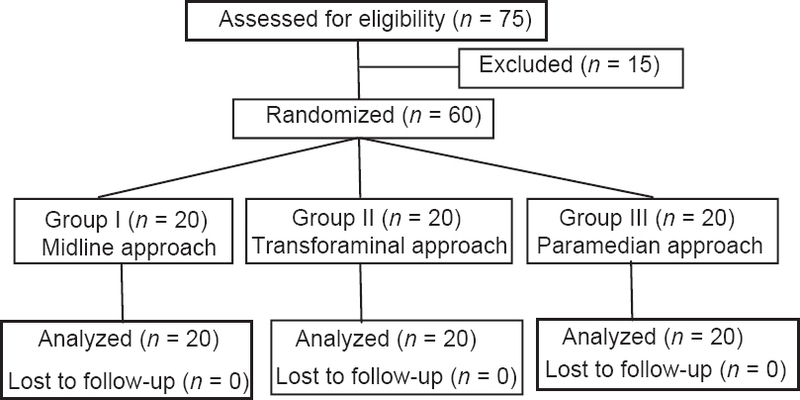 Methods: In this double-blinded clinical trial, 60 American Society of Anesthesiologist Class I and II patients posted to undergo upper extremity surgery were divided into 2 different groups randomly. In Group A, the patients received 30 ml levobupivacaine 0.5% plus 2 ml normal saline and Group B patients received 30 ml levobupivacaine 0.5% plus 5 mg verapamil diluted to 2 ml normal saline for supraclavicular block. Time of request for rescue analgesia, onset and duration of sensory motor blocks and changes in hemodynamic parameters were studied and analyzed. P < 0.001 was considered statistically significant. Result s: Time for a request for rescue analgesia was 425.80 ± 90.46 min in Group B and 366.13 ± 70.42 min in Group A which was clinically significant. The mean of sensory and motor block onset time in Group B was less than in Group A, the difference between the two groups being statistically significant (P < 0.001). In Group A, mean duration of sensory block was 316.13 ± 91.08 min and in Group B was 375.83 ± 114.48 min, which was statistically significant (P < 0.001). Conclusion: The addition of verapamil as an adjuvant to levobupivacaine in brachial plexus blockade delayed the requirement of rescue analgesia with decreased onset time and prolonged duration of sensory and motor block characteristics. Background: Intravenous regional anaesthesia is a simple, safe and effective technique with good success rate for upper limb surgeries. The duration of postoperative analgesia is an important limitation of this technique. Various adjuvants have been used to overcome this drawback. In this study we evaluate the effect of dexmedetomidine 0.5 μgkg-1 as an adjuvant for lignocaine intravenous regional anaesthesia. 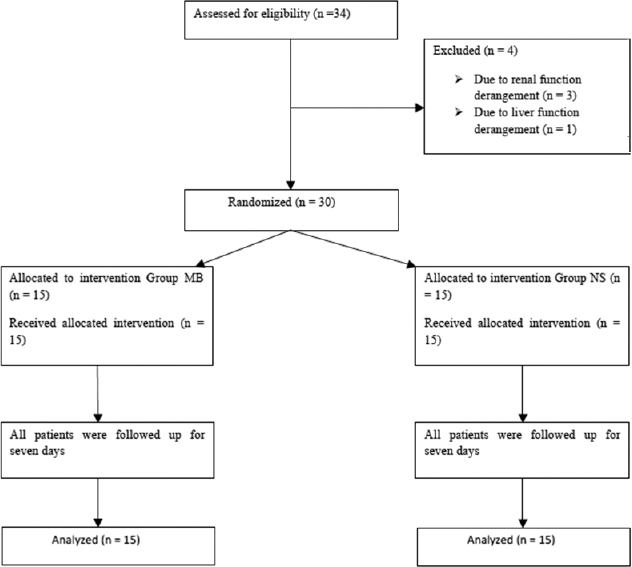 Methods: Sixty patients scheduled to undergo upper limb surgery were randomised to receive intravenous regional anaesthesia with lignocaine alone (Group L) or lignocaine with dexmedetomidine 0.5 μgkg-1 (Group LD). The quality of anaesthesia, onset of sensory and motor blocks and duration of postoperative analgesia were noted. Results: The onset of sensory and motor block was significantly rapid in group LD compared to group L (Group LD v/s Group L, sensory block: 2.5min ± 0.5v/s6.34min ± 0.7; motor block: 8.5min ± 1.05v/s14.78min ± 0.6; P < 0.001). The quality of anaesthesia was superior in group LD compared to group L and the duration of postoperative analgesia was also longer in group LD. Conclusion: Dexmedetomidine 0.5 μkg-1 as an adjuvant to lignocaine for IVRA shortens the onset of sensory and motor blocks, improves the quality of anaesthesia and provides longer postoperative analgesia. Context: Methylene blue is an inhibitor of guanylate cyclase and hence prevents vasoplegia mediated by nitric oxide in patients with sepsis. Aims: This study aimed to analyze the effect of methylene blue on blood pressure maintenance following induction of anesthesia in patients presenting with peritonitis. Subjects and Methods: Thirty patients diagnosed to have perforation peritonitis were randomized into two groups (Group MB, Group NS). Patients in Group MB were given injection methylene blue 2 mg/kg over 20 min and patients in Group NS were given 50 ml of normal saline over 20 min, before induction. Heart rate, mean arterial pressure (MAP), cardiac output, and systemic vascular resistance (SVR) were recorded every 5 min for 1 h after infusion. Statistical Analysis: Hemodynamic parameters were analyzed using repeated-measures analysis of variance with Bonferroni's test. Blood gas analysis was analyzed using independent Student's t-test, and P < 0.05 was considered statistically significant. Results: MAP was lower at all-time points in Group NS than Group MB; however, it was statistically significant immediately, and 5 min the following induction. MAP fell from 94.8 ± 11.8 mmHg to 89.2 ± 16.0 mmHg immediate postinduction in Group MB and from 92.1 ± 9.8 mmHg to 74.1 ± 12.6 mmHg in Group NS. MAP and SVR were significantly higher in Group MB, 5 min following induction. No adverse events attributable to methylene blue were noted. Conclusions: Methylene blue contributes to the maintenance of postinduction hemodynamic stability in patients with perforation peritonitis. Background: Anesthesiologists play an important role in postoperative pain management. For analgesia after lower abdominal surgery, epidural analgesia and ultrasound-guided transversus abdominis plane (TAP) block are suitable options. The study aims to compare the analgesic efficacy of both techniques. Materials and Methods: Seventy-two patients undergoing lower abdominal surgery under spinal anesthesia were randomized to postoperatively receive lumbar epidural catheter (Group E) or ultrasound-guided TAP block (Group T) through intravenous cannulas placed bilaterally. Group E received 10 ml 0.125% bupivacaine stat and 10 ml 8th hourly for 48 h. Group T received 20 ml 0.125% bupivacaine bilaterally stat and 20 ml bilaterally 8th hourly for 48 h. Pain at rest and on coughing, total paracetamol and tramadol consumption were recorded. 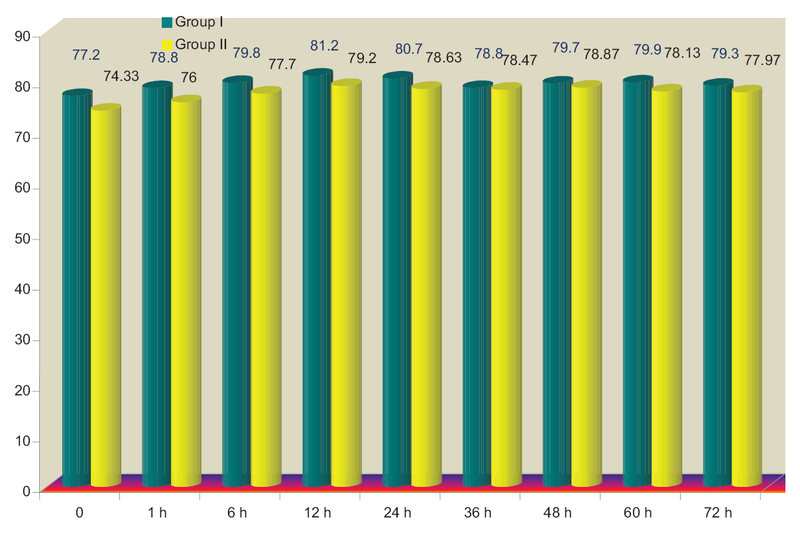 Results: Analgesia at rest was comparable between the groups in the first 16 h. At 24 and 48 h, Group E had significantly better analgesia at rest (P = 0.001 and 0.004 respectively). Patients in Group E had significantly higher number of patients with nil or mild pain on coughing at all times. Paracetamol consumption was comparable in both groups, but tramadol consumption was significantly higher in Group T at the end of 48 h (P = 0.001). Conclusion: For lower abdominal surgeries, analgesia provided by intermittent boluses of 0.125% is comparable for first 16 h between epidural and TAP catheters. However, the quality of analgesia provided by the epidural catheter is superior to that provided by TAP catheters beyond that both at rest and on coughing with reduced opioid consumption. Background: Gabapentinoids have been used as preemptive analgesics for pain management following laparoscopic cholecystectomy. Recently, multimodal analgesic techniques have been found superior to preemptive analgesia alone. Aim: The aim of this study is to evaluate and compare a single preoperative dose of pregabalin 150 mg and gabapentin 300 mg for pain relief following laparoscopic cholecystectomy as a part of multimodal drug regime. Settings and Design: This randomized, single-blind study was conducted after Ethical Committee approval and written informed consent from the patients. Materials and Methods: Fifty patients undergoing laparoscopic cholecystectomy under general anesthesia were randomly allocated to receive either 150 mg pregabalin (Group PG), or 300 mg gabapentin (Group GB) orally, 2 h before surgery. Standard anesthesia induction and maintenance were done. For intraoperative pain management, injection fentanyl 2 μg.kg-1 intravenous (IV) along with injection voveran 75 mg IV and port site infiltration was used. Postoperatively, injection diclofenac 75 mg intramuscular TDS was continued. 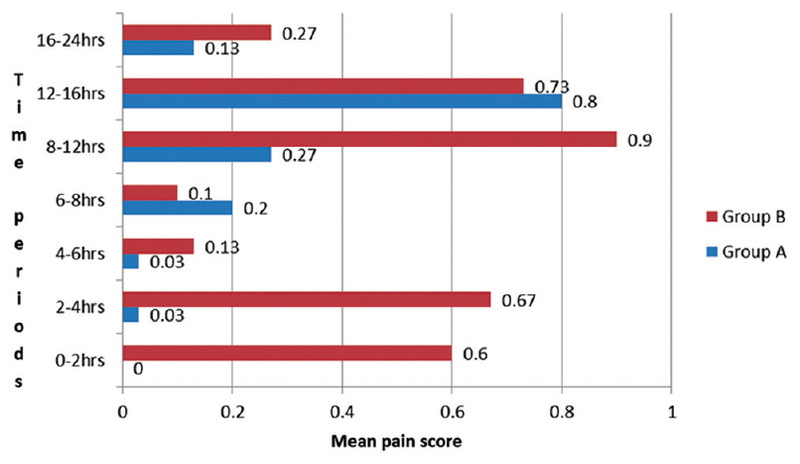 Severity of postoperative pain (visual analog scale [VAS]), postoperative fentanyl requirement and incidence, and severity of side effects were assessed. When VAS >40 mm or on patient's request, a Fentanyl bolus at an increment of 25–50 μg IV was given as rescue analgesia. Results: Intraoperative fentanyl requirement was 135 ± 14 μg in Group PG and 140 ± 14 μg in Group GB (P = 0.21). Postoperative, fentanyl requirement was 123 ± 18 μg in Group PG and 131 ± 23 μg in Group GB (P = 0.17) There was no statistically significant difference in the VAS score for static and dynamic pain. Time to the first requirement of analgesic was 5.4 ± 1.1 h in Group PG and 4.6 ± 1.6 h in Group GB (P = 0.015). No side effects were observed. Conclusion: We conclude that a single preoperative dose of pregabalin (150 mg) or gabapentin (300 mg) are equally efficacious in providing pain relief following laparoscopic cholecystectomy as a part of multimodal regime without any side effects. Background: Dexmedetomidine, an α2adrenergic agonist, has been found to be a useful adjuvant to local anesthetics. It has been found to produce satisfactory block with lower doses of spinal bupivacaine. Aim: The aim of this study is to compare the difference in spinal block characteristics and hemodynamic effects of 7, 8, and 9 mg hyperbaric bupivacaine combined with 5 μg dexmedetomidine and to find out the optimum dose that would provide satisfactory block and hemodynamic stability for lower limb orthopedic surgeries. Settings and Study Design: This was a prospective, observational study. Materials and Methods: Ninety patients undergoing lower limb orthopedic surgeries were allocated to three groups of thirty each. Group A received 7 mg, Group B 8 mg and Group C 9 mg 0.5% hyperbaric bupivacaine along with dexmedetomidine 5 μg. The spinal block characteristics, hemodynamic stability, and side effects were compared. Statistical Analysis: The quantitative variables were compared using ANOVA test and the qualitative variables using Chi-square test. Results: All three groups had satisfactory anesthesia and analgesia. The onset of analgesia was slower and peak sensory level lower in Group A. The onset of motor block, time to attain peak sensory levels, duration of analgesia, maximum pain scores, and requirement of rescue analgesics were comparable among groups. Duration of motor block and time of regression of sensory level were more in Group C. Hemodynamics and sedation scores were comparable. Conclusion: Dexmedetomidine with lower doses of bupivacaine produces satisfactory anesthesia without hemodynamic instability. A dose of 7 mg bupivacaine with 5 μg dexmedetomidine may be sufficient for orthopedic surgeries. 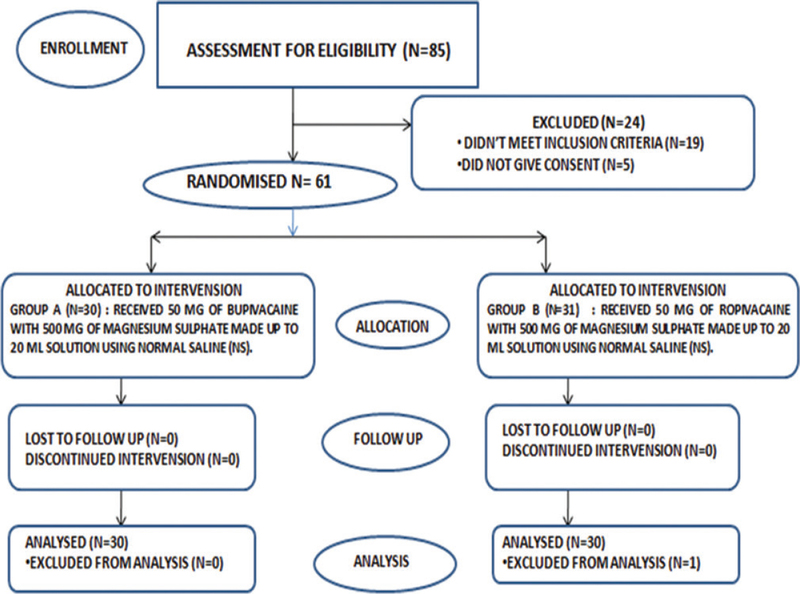 Aim: The objective of this study was to assess and compare the analgesic duration of local infiltration of bupivacaine plus magnesium sulfate and ropivacaine plus magnesium sulfate for postoperative analgesia in patients undergoing lumbar laminectomy. Study Design: A randomized, prospective, double-blinded single hospital, comparative study. Methods: Sixty adult patients of the American Society of Anesthesiologists physical Status I and II were randomly allocated into two Groups BM and RM, comprising 30 and 31 patients. Postlumbar laminectomy, the study drug was locally infiltrated into the paravertebral muscles on either side before skin closure. Group BM was given 20 ml of 0.25% bupivacaine combined with 500 mg of magnesium sulfate (constituted with normal saline [NS]), and Group RM was given 20 ml of 0.25% ropivacaine combined with 500 mg of magnesium sulfate (constituted with NS). Postoperative visual analog scale pain score was assessed hourly for the first 24 h postoperatively. Duration of postoperative analgesia, rescue analgesia consumption and side effects were also recorded. Statistical Analysis: Comparison of data between the groups was done with SPSS 21.0© using independent t-test, Chi-square test, and Mann–Whitney U-test accordingly. P<0.05 was considered statistically significant. Results: Time to first analgesic consumption was significantly longer in Group BM (7.3 ± 0.46 h) compared to Group RM (6.6 ± 0.69 h) (P < 0.05). The consumption of nalbuphine rescue analgesic was significantly higher in Group RM (15.33 ± 5.07 mg) compared to Group BM (12 ± 4.07 mg) (P < 0.05). Conclusion: Wound infiltration with bupivacaine and magnesium sulfate compared to ropivacaine and magnesium sulfate provided longer duration of postoperative analgesia and significantly reduced postoperative opioid consumption in patients undergoing lumbar laminectomy. Context: Different adjuvants are coadministered with local anesthetics to improve the speed of onset and duration of analgesia, and to reduce the dose, the selection of which is often left to the choice of an anesthesiologist. Aim: The aim of this study was to compare the analgesic efficacy and safety profile of fentanyl and clonidine as an adjuvant to epidural ropivacaine anesthesia. Setting and Design: With institutional ethical committee clearance, a prospective, randomized, placebo-controlled double-blind clinical study was conducted at Vivekananda Polyclinic and Institute of Medical Sciences, Lucknow. Material and Methods: Two groups with thirty patients each were randomly allocated to receive 15–20 ml of 0.75% ropivacaine with 75 μg clonidine or 15–20 ml of 0.75% ropivacaine with 75 μg fentanyl, respectively. Block characteristics such as onset of analgesia, maximum level of sensory blockade, complete motor blockade, hemodynamic, time to two-segment regressions, time for rescue analgesia, time to complete motor recovery, and side effects were analyzed. Results: Results showed that the onset of blockade is faster when fentanyl is used as additives. 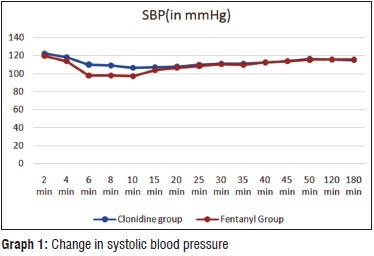 Time for two-segment regression was earlier in fentanyl group but time for rescue analgesia was longer in clonidine group. Statistical Analysis: Two groups were compared by Student's t-test and Chi-square test; ANOVA and significance of mean difference bet were done by Newman–Keuls test. Conclusion: Addition of clonidine to epidural ropivacaine provides superior analgesia than the addition of fentanyl to epidural ropivacaine without much difference in side effect profile. Objectives: The objective of this study was to evaluate the clinical efficacy of epidural steroid injections through different approaches using pain relief and improvement in functional capacity as outcome measures. Materials and Methods: Sixty patients with low backache and unilateral radiculopathy were randomly assigned to three groups of twenty patients each, for undergoing lumbar epidural steroid injection (LESI) through midline, transforaminal, and paramedian approaches under fluoroscopic guidance. All the patients were assessed at 1 week, 1 month and 3 months postintervention using visual analog scale (VAS) score, Quebec disability score, and depression score. Results: The primary and secondary outcome measured in terms of improvement of VAS showed statistically significant reduction (P < 0.05) when compared to preprocedure baseline readings on both intragroup analysis (Groups I, II and III) at 1-week, 1-month, and 3-month follow-up. However, on intergroup comparison, the difference in improvement of VAS score noted was statistically insignificant with P value of 0.07 (Group I/II), 0.19 (Group II/III), 0.85 (Group I/III) at final 3rd month follow-up. In addition, intergroup comparison for secondary outcome showed statistically insignificant improvement (P value for Quebec score 0.73 [Group I/II], 0.34 [Group II/III], 0.79 [Group I/III] and depression score 0.78 [Group I/II], 0.67 [Group II/III], 0.98 [Group I/III]) at final 3rd month follow-up. Conclusions: All three LESI approaches proved highly effective individually in terms of short-term pain relief, improvement in the quality of life, and depression; however, none proved to be better than the other. Introduction: Anesthetists come in contact with more than two-third of hospital patients. Timely referral to anesthetists is vital in perioperative and remote site settings. Delayed referrals, improper referrals, and referrals at inappropriate levels can result in inadequate preparation, perioperative complications, and poor outcome. 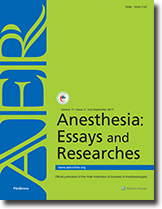 Methods: The self administered paper survey to delegates attending anesthesia conferences. Questions were asked on how high-risk, emergency surgical cases remote site and critical care patients were referred to anesthetists and presence of rapid response teams. Results: The response rate was 43.8%. Sixty percent (55.3–64.8, P - 0.001) reported high-risk elective cases were referred after admission. Sixty-eight percent (63.42–72.45, P - 0.001) opined preoperative resting echocardiographs were useful. Six percent (4.16–8.98, P - 0.001) reported emergency room referral before arrival of the patient. Twenty-five percent (20.92–29.42, P - 0.001) indicated high-risk obstetric cases were referred immediately after admission. Consultants practiced preoperative stabilization more commonly than residents (32% vs. 22%) (P - 0.004). For emergency surgery, resident referrals occurred after surgery time was fixed (40% vs. 28%) (P - 0.012). Residents dealt with more cases without full investigations in obstetrics (28% vs. 15) (P = 0.002). Remote site patients were commonly referred to residents after sedation attempts (32% vs. 20%) (P = 0.036). Only 34.8 said hosptals where tbey practiced had dedicated cardiac arrest team in place. Conclusions: Anesthetic departments must periodically assess whether subgroups of patients are being referred in line with current guidelines. Cancellations, critical incidents and complications arising out of referral delays, and improper referrals must be recorded as referral incidents and a separate referral incident registry must be maintained in each department. Regular referral audits must be encouraged. Background: Quality of postoperative analgesia after cesarean section makes difference to mother in child bonding, early ambulation, and discharge. Ilioinguinal iliohypogastric (ILIH) and transverse abdominis plane (TAP) block had been tried to reduce the opioid analgesics, but the relative efficacy is unknown. Hence, this study was designed to compare the efficacy of these two regional analgesic techniques in sparing postoperative rescue analgesic requirement following lower segment cesarean section (LSCS). Methods: Sixty patients who underwent LSCS were randomly allocated into two groups to receive either US-guided TAP block or ILIH nerve block using sealed envelope technique at the end of the surgery. In the postoperative ward, whenever patient complained of pain, pain nurse in-charge administered the rescue analgesics as per the study protocol. A blinded observer visited the patient at 0, 2, 4, 6, 8, 10, 12, and 24 h postoperative intervals and recorded the quality of pain relief and the amount of rescue analgesic consumed. Results: All patients in both the study groups required one dose of rescue analgesics in the form of injection diclofenac sodium 50 mg intravenously but subsequently 57% of patients did not require any further analgesics till 24 h in the TAP block group whereas in ILIH group, only 13% did not require further analgesics (P = 0.00), correspondingly the cumulative tramadol dose was significantly higher at all the time interval in the ILIH group when compared to the TAP group. Conclusion: Quality of postoperative analgesia provided by TAP block was superior to ILIH block following LSCS. Background: Effective management of postoperative pain is a part of well-organized perioperative care, which helps in reduced morbidity and improved patient satisfaction. Preventive analgesia can reduce acute and chronic pain by blocking the noxious inputs to pain pathways, preventing sensitization. Studies have reported efficacy of gabapentin as a preventive analgesic in perioperative pain. 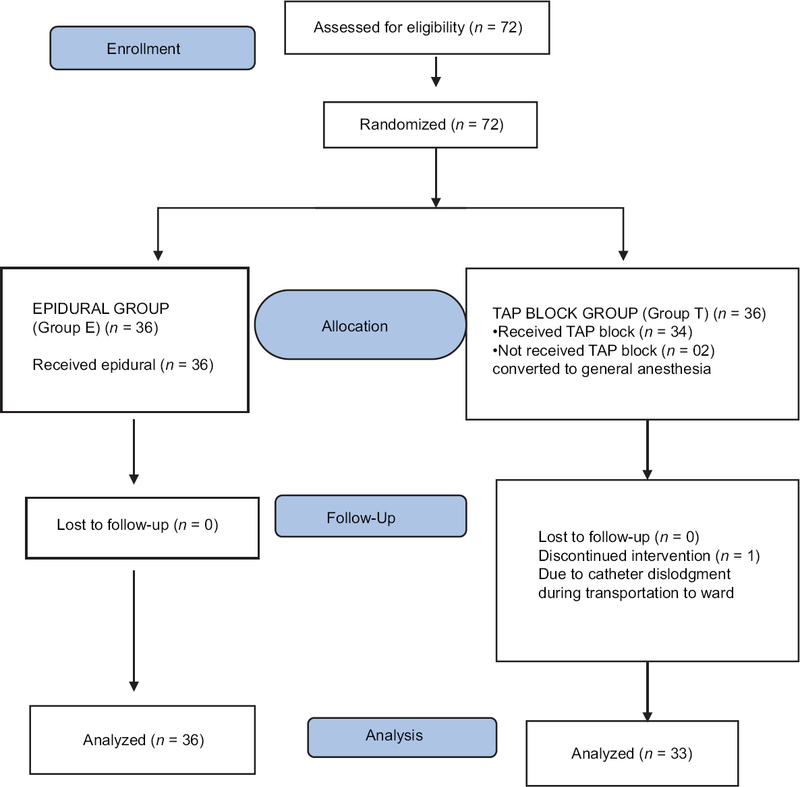 In this study, we aimed to determine whether preoperative gabapentin reduced postoperative pain and tramadol consumption after thyroidectomy under general anesthesia. Materials and Methods: Sixty patients scheduled for thyroidectomy were allocated to two groups of thirty each for this prospective, observational study. Patients in Group A and Group B received oral gabapentin 600 mg (6 × 10−4 kg) and diazepam 10 mg (1 × 10−5 kg), respectively, 2 h prior to surgery. Tramadol was given as rescue analgesic for postoperative pain with a verbal rating score of two. The analgesic efficacy of preoperative gabapentin was assessed in terms of postoperative pain scores at rest or swallowing, time to first rescue analgesic, and total tramadol consumption for 24 h. Ramsay sedation score and side effects of drug were also looked into. Results: Postoperative pain scores and total tramadol consumption were significantly lower in Group A during 24 h (P = 0.00). Time to first rescue analgesic was significantly prolonged in Group A (P = 0.001). Side effects were comparable. Conclusion: Oral gabapentin is effective as a preventive analgesic in reducing postoperative pain and tramadol consumption after thyroidectomy under general anesthesia. Context: Inguinal hernia repair (IHR) is a common surgical procedure which can be performed under general, regional, or peripheral nerve block anesthesia. Aim: The aim of our study was to compare the efficacy of paravertebral block (PVB) with spinal anesthesia (SA) for IHR with respect to postoperative analgesia, ambulation, and adverse effects. Settings and Design: This was a prospective, single-blind randomized controlled trial. Materials and Methods: Sixty American Society of Anesthesiologists Class I–II patients of 20–60 years scheduled for IHR were randomized by a computer-generated list into two groups of thirty each, to receive either PVB (Group PVB: at T12–L2 levels, 10 ml of 0.5% levobupivacaine at each level) or SA (Group SA: at L3–L4/L2–L3 level, 2.5 ml of 0.5% levobupivacaine). Primary outcome was duration of postoperative analgesia and time to reach discharge criteria. Secondary outcome was time to ambulation, time to perform the block, time to surgical anesthesia, total rescue analgesic consumption, adverse effects, hemodynamic changes, patient, and surgeon satisfaction. Statistical Analysis Used: Student's t-test, Chi-square test as applicable, and Statistical Package for Social Sciences (version 14.0, SPSS Inc., Chicago, IL, USA) were used. Results: Time to the first analgesic requirement was 15.17 ± 3.35 h in Group PVB and 4.67 ± 1.03 h in Group SA (P < 0.001). Time to reach the discharge criteria was significantly shorter in Group PVB than Group SA (P < 0.001). Conclusion: PVB is advantageous in terms of prolonged postoperative analgesia and encourages early ambulation compared to SA. Context: Anesthesia and analgesia for surgeries to the upper extremity are commonly provided using brachial plexus anesthesia. There are limited or almost no studies comparing the use of ropivacaine with fentanyl to ropivacaine with dexmedetomidine. Aims: To compare the efficacy of fentanyl and dexmedetomidine as adjuvants to ropivacaine for brachial plexus block among patients undergoing upper limb orthopedic surgeries. Settings and Design: This was a prospective, randomized, double-blinded study. Subjects and Methods: The patients were randomly divided into three groups of 35 each using computerized randomization table. Group I patients received 3 mg/kg of 0.75% ropivacaine with 1 μg/kg of fentanyl diluted with normal saline (NS) to make a total volume of 35 ml. Group II patients received 3 mg/kg of 0.75% ropivacaine with 1 μg/kg of dexmedetomidine diluted with NS to make a total volume of 35 ml. Group III patients received 3 mg/kg of 0.75% ropivacaine with NS making a total volume of 35 ml. Statistical Analysis Used: Statistical analysis was performed using Statistical Package for Social Sciences, version 15.0. Analysis of variance followed by independent samples t-test was performed for parametric data, and Kruskal–Wallis test followed by Mann–Whitney U-test was performed for nonparametric data. Results: Mean motor and sensory block onset time was minimum in Group I and maximum in Group III while mean duration of sensory and motor block was maximum in Group I and minimum in Group III. Time taken for first rescue analgesic dose was also maximum in Group I and minimum in Group III. Conclusions: It can be concluded that 3 mg/kg of 0.75% ropivacaine along with 1 μg/kg of fentanyl diluted with NS to make a total volume of 35 ml was the most efficacious regimen for brachial plexus block among patients undergoing upper limb orthopedic surgeries. Background: Preemptive analgesia has the potential to be more effective than a similar analgesic treatment initiated after surgery as it reduces immediate postoperative pain as well as chronic pain. Aim: To study the efficacy of preemptive analgesia with intraperitoneal instillation of ropivacaine in laparoscopic cholecystectomy (LC). Materials and Methods: This prospective randomized double-blind study was conducted on patients undergoing LC. Hundred patients were randomly divided into two groups of fifty each. In Group A, patients received 3 mg/kg of ropivacaine intraperitoneal instillation in 100 ml normal saline (NS) before creation of pneumoperitoneum and in Group B patients received 3 mg/kg of ropivacaine intraperitoneal instillation in 100 ml NS after completion of surgery. Postoperative visual analog scale score for abdominal and shoulder tip pain alongwith requirement of rescue analgesic were recorded for 24 h. Results: Significantly lower visual analog scores for pain were observed in Group A versus Group B. Group A reported significantly lower pain at 0 h (P < 0.001), 1 h (P = 0.003), 3 h (P = 0.006), 6 h (P = 0.003), and 12 h (P = 0.001) postoperatively, but the difference was not statistically significant after 12 h. The mean time of first rescue analgesic was 472.8 ± 26.32 min in Group A, as compared with 189 ± 11.87 min in Group B. A significantly lower analgesic requirement was observed in Group A versus Group B throughout the entire study period (P < 0.05). Conclusion: The preemptive analgesia with intraperitoneal instillation of ropivacaine before creation of pneumoperitoneum is much more effective for postoperative pain relief in comparison to intraperitoneal instillation of ropivacaine after completion of surgery. Background: Direct layngoscopy and endotracheal intubation is a noxious stimuli and induces sympathomimetic responses. Although well tolerated in healthy subjects, it may impose life threatening arrhythmias, left ventricular failure or rupture of cerebral aneurysm in susceptible patients. Esmolol, Labetalol and Lignocaine attenuate these responses but are associated with side effects of bradycardia, hypotension etc. In lower doses, chances of these side effects are comparatively low. So we designed this prospective clinical trial to assess the efficacy of intravenous esmolol, labetalol and lignocaine in low doses for attenuation of sympathomimetic responses to endotracheal intubation. 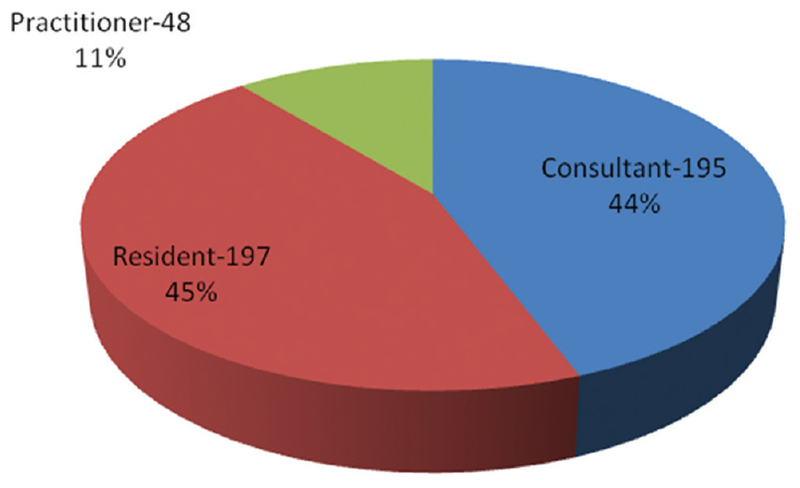 Materials and Methods: Seventy-five consenting patients of ASA physical status I or II of age range 20 to 60 years, scheduled for different general surgical procedures were randomly assigned to one of the three groups; group ES, group LB and group LG. Participants of group ES, group LB and group LG was given esmolol HCL 0.5 mg/Kg, labetalol HCL 0.25 mg/kg and lignocaine HCL 1 mg/Kg body weight respectively. Outcome variables were HR, SBP, DBP, MAP and RPP. These variables were recorded just after intubation and thereafter at 1,3,5, 7 and 10 minutes of intubation. Results: There was no statistically significant difference regarding the demographic characteristics of the groups. Heart rate and systolic blood pressure was lower throughout the study period in labetalol group. But the values of study parameters were always higher than the baseline in esmolol and lignocaine group. Values of mean arterial pressure was slightly higher in labetalol group but it was much higher in two other groups throughout the study period. Diastolic blood pressure was higher in all the groups. Values of rate pressure product was higher during intubation and at 1minute after intubation in labetalol group but thereafter it was always lower than baseline values. Conclusion: Labetalol 0.25 mg Kg-1 is an effective and safe drug to be used for attenuation of sympathomimetic responses to endotracheal intubation. Esmolol 0.5 mg Kg-1 and lignocaine 1 mg Kg-1 are also effective to some extent and are safe. Background: In this meta-analysis, we explore the role of repetitive transcranial magnetic stimulation (rTMS), a noninvasive neuromodulation technique in the treatment of chronic pain. Methods: Studies comparing rTMS and conventional treatment for chronic pain were searched. The comparison was made for decrease in the pain scores with and without (sham) the use of rTMS after a follow-up interval of 4–8 weeks. 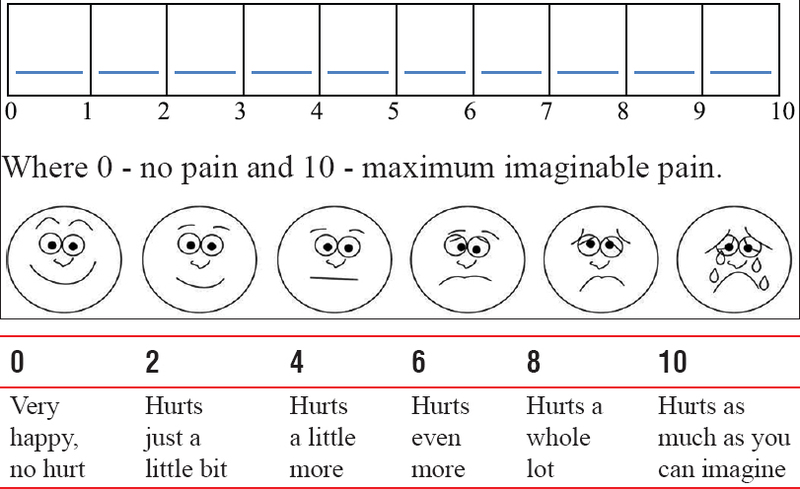 All reported pain scores were converted into a common scale ranging from “0” (no pain) to “10” (worst pain). Results: Nine trials with 183 patients in each of the groups were included in the analysis. The decrease in pain scores with rTMS was 1.12 (95% confidence interval [CI] being 1.46–0.78) (fixed effects, I2 = 0%, P < 0.001) and in sham-rTMS was 0.28 (95% CI being 0.49–0.07) (Fixed effects, I2 = 0, P = 0.01). The pooled mean drop in pain scores with rTMS therapy was higher by 0.79 (95% CI being 0.26–1.33) (fixed effects, I2 = 0, P < 0.01). The duration and frequency of rTMS were highly variable across trials. Publication bias was unlikely (Egger's test, X-intercept = 0.13, P = 0.75). Conclusions: Use of rTMS improves the efficacy of conventional medical treatment in chronic pain patients. This treatment is not associated with any direct adverse effects. However, the duration and frequency of rTMS therapy is presently highly variable and needs standardization. Background: The effect of positive end-expiratory pressure (PEEP) has been studied in detail after induction of general anesthesia especially in obese individuals. However, sparse information can be gathered from the literature regarding its effect when applied at the time of induction and the time of onset of its effect. Thus, this study was planned to assess the effect of PEEP when applied for a single minute in morbidly obese patients. Materials and Methods: This was a randomized prospective study comprising seven morbidly obese patients (body mass index ≥40 kg/m2). Control group included 30 patients who received no PEEP at the time of induction. The study group consisted of thirty patients who were given a PEEP of 10 cmH2O. Serial arterial blood gas samples were taken preoperatively, at the time of intubation, 5 min after intubation and 10 min after intubation. Results: PaO2was significantly higher in test group (242.0 ± 116.0 mmHg) than in control group (183.0 ± 107.0 mmHg) just after intubation. PaCO2was comparable in control group (43.73 ± 6.32 mmHg) and test group (44.52 ± 6.33 mmHg) just after intubation but was significantly less in test group than in control group at 5 and 10 min thereafter. Hemodynamic parameters were comparable in both groups at all time intervals. 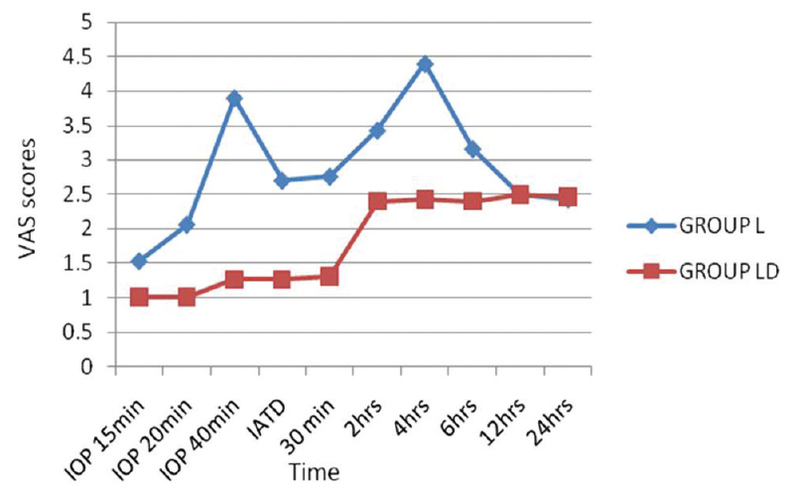 Conclusion: Application of even a single minute of PEEP at the time of induction improves oxygenation without any adverse effects on hemodynamics, in morbidly obese patients undergoing laparoscopic Bariatric surgery. Background: Proper positioning of the head and neck is important for an optimal laryngeal visualization. Traditionally, sniffing position (SP) is recommended to provide a superior glottic visualization, during direct laryngoscopy, enhancing the ease of intubation. Various studies in the last decade of this belief have challenged the need for sniffing position during intubation. We conducted a prospective study comparing the sniffing head position with simple head extension to study the laryngoscopic view and intubation difficulty during direct laryngoscopy. Materials and Methods: Five-hundred patients were included in this study and randomly distributed to SP or simple head extension. In the sniffing group, an incompressible head ring was placed under the head to raise its height by 7 cm from the neutral plane followed by maximal extension of the head. In the simple extension group, no headrest was placed under the head; however, maximal head extension was given at the time of laryngoscopy. Various factors as ability to mask ventilate, laryngoscopic visualization, intubation difficulty, and posture of the anesthesiologist during laryngoscopy and tracheal intubation were noted. In the incidence of difficult laryngoscopy (Cormack Grade III and IV), Intubation Difficulty Scale (IDS score) was compared between the two groups. Results: There was no significant difference between two groups in Cormack grades. The IDS score differed significantly between sniffing group and simple extension group (P = 0.000) with an increased difficulty during intubation in the simple head extension. Patients with simple head extension needed more lifting force, increased use of external laryngeal manipulation, and an increased use of alternate techniques during intubation when compared to SP. Conclusion: We conclude that compared to the simple head extension position, the SP should be used as a standard head position for intubation attempts under general anesthesia. Background: Ultrasound-guided transversus abdominis plane (TAP) block is done as a part of multimodal analgesia for pain relief after abdominal surgeries. This prospective randomized, double-blind, placebo-controlled trial was conducted to evaluate the postoperative analgesic efficacy of bilateral TAP block in patients undergoing midline colorectal surgeries using ropivacaine. 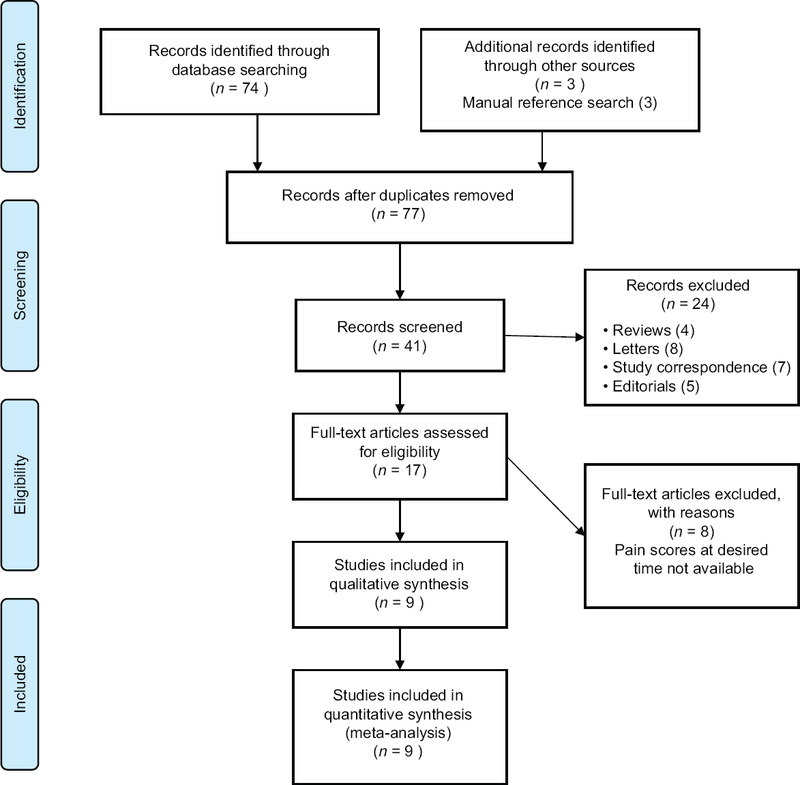 Materials and Methods: Eighty patients scheduled for elective colorectal surgeries involving midline abdominal wall incision under general anesthesia were enrolled in this prospective randomized controlled trial. Group A received TAP block with 20 ml of 0.2% ropivacaine on either side of the abdominal wall, and Group B received 20 ml of normal saline. The time to request for rescue analgesia, total analgesic consumption in 24 h, and satisfaction with the anesthetic technique were assessed. Results: The mean visual analog scale scores at rest and on coughing were higher in control group (P > 0.05). 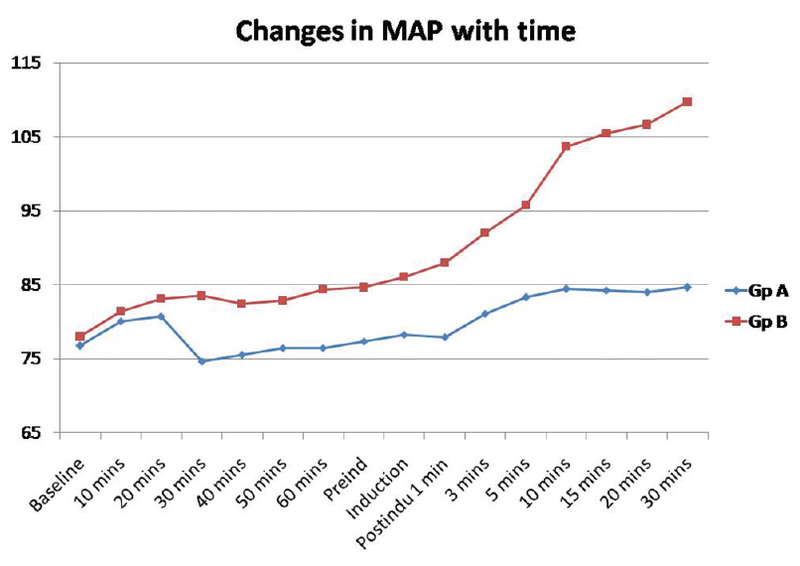 Time (min) to request for the first rescue analgesia was prolonged in study group compared to control group (P < 0.001). The total tramadol consumption in 24 h postoperatively was significantly high in control group (P < 0.001). 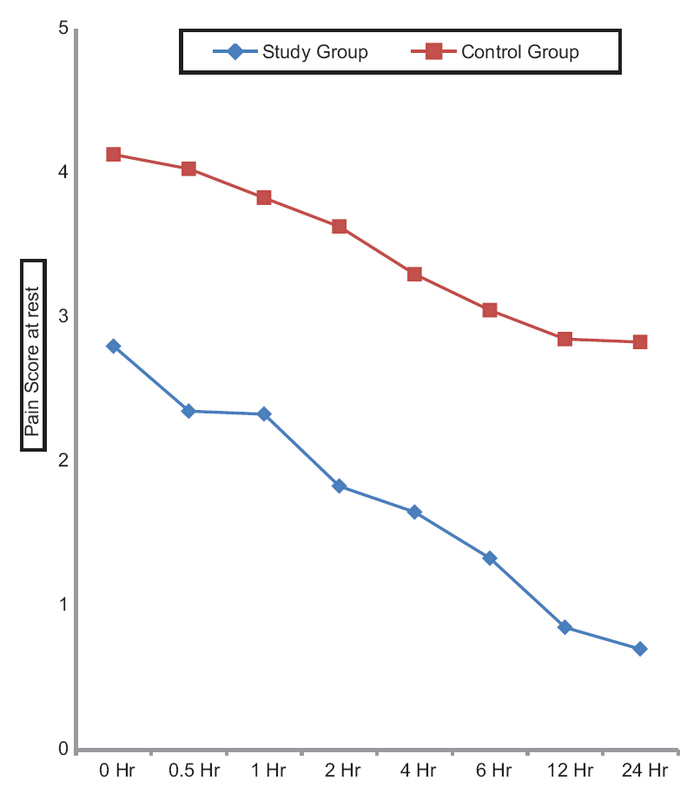 Nausea/vomiting was more common in control group (P > 0.05). The level of satisfaction concerning postoperative pain control/anesthetic technique was higher in study group (P < 0.001). Conclusion: TAP block produces effective and prolonged postoperative analgesia in patients undergoing midline colorectal surgery. It is a technically simple block to perform with a high margin of safety. It produces a considerable reduction in mean intravenous postoperative tramadol requirements, reduction in postoperative pain scores, and increased time to first request for further analgesia, both at rest and on movement. Central venous catheter (CVC) placement is not only restricted to Intensive Care Units and operation theaters but its horizon has also expanded to the bedside placements. Meticulous care and aids such as ultrasound and fluoroscopy dramatically increase the successful placement of needles, guidewires, and catheters, but still a large number of catheter misplacements can occur. The formation of a loop in CVC is a rare complication occurring mostly during right-sided catheterization. We report a rare complication of coiling of left subclavian CVC. Persistent hiccup is uncommon, and the mechanism is poorly understood. We present the case of a 43-year-old male patient referred to the Algology department due to chronic back pain who developed what we believe a rare case of persistent hiccup secondary to caudal epidural steroid injection (CESI). The causes of hiccup are many and include electrolyte derangement, nutritional deficiencies, gastrointestinal disorders and instrumentation, cardiovascular disorders, renal impairment, central nervous system disorders, and drugs; however, the cause may be unknown. CESI is one of the treatments of back pain, in addition to various other modalities including surgical interventions. CESI has gained rapid and widespread acceptance for the treatment of lumbar and lower extremity pain. However, there are only a few well-designed, randomized, controlled studies on the effectiveness of steroid injections. Consequently, side effects should be considered. We aimed to present a persistent hiccup after CESI for chronic low back pain. 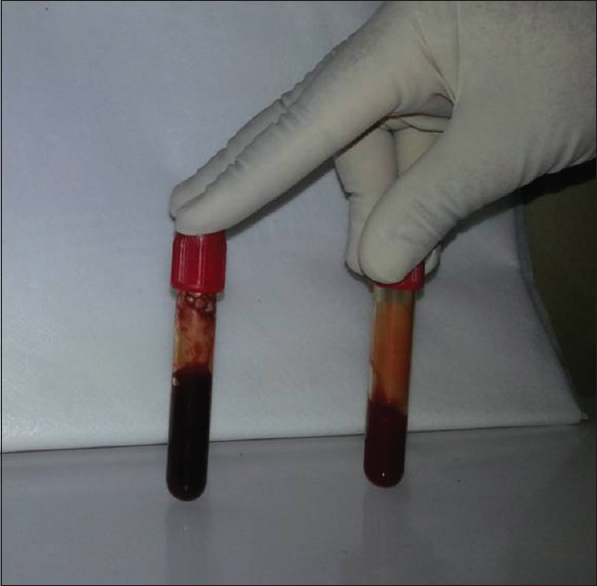 A 24-year-old woman with previous undiagnosed congenital methemoglobinemia presented for the emergency cesarean section in view of fetal distress. The patient had a persistent low oxygen saturation on pulse oximetry with normal heart rate and blood pressure. Arterial blood gas values were normal. The patient was asymptomatic and respiratory and cardiovascular system examination was normal. The patient underwent cesarean section under general anesthesia and was shifted to the Intensive Care Unit postoperatively. The oxygen saturation was low throughout the intraoperative and postoperative period. A complete evaluation was done postoperatively. Mass spectrophotometry was done, which confirmed methemoglobinemia in the patient. Laparoscopic surgery is normally performed under general anesthesia, but regional techniques like thoracic epidural and lumbar spinal have been emerging and found beneficial.We performed a clinical case study of segmental thoracic spinal anaesthesia in a healthy patient.We selected an ASA grade I patient undergoing elective laparoscopic cholecystectomy and gave spinal anesthetic in T10-11 interspace using 1 ml of bupivacaine 5 mg ml−1 mixed with 0.5 ml of fentanyl 50 μg ml−1. Other drugs were only given (systemically) to manage patient anxiety, pain, nausea, hypotension,or pruritus during or after surgery. 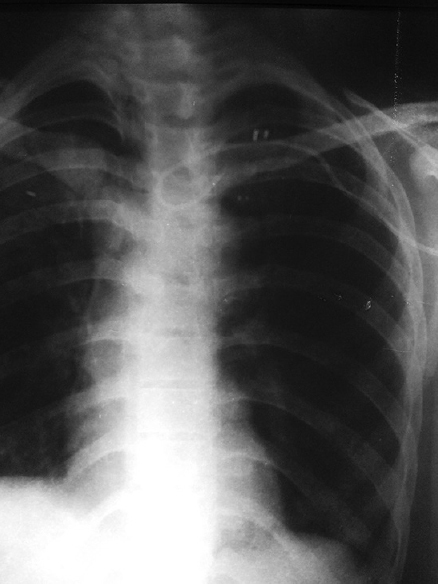 The patient was reviewed 2 days postoperatively in ward.The thoracic spinal anesthetia was performed easily in the patient.Some discomfort which was readily treated with 1mg midazolam and 20 mg ketamine intravenously.There was no neurological deficit and hemodynamic parameters were in normal range intra and post-operatively and recovery was uneventful. We used a narrow gauze (26G) spinal needle which minimized the trauma to the patient and the chances of PDPH, which was more if 16 or 18G epidural needle had been used and could have increased further if there have been accidental dura puncture. Also using spinal anesthesia was economical although it should be done cautiously as we are giving spinal anesthesia above the level of termination of spinal cord. Arteriovenous (AV) malformations of the face are rare presentations. Endovascular coiling is one of the treatment modalities. 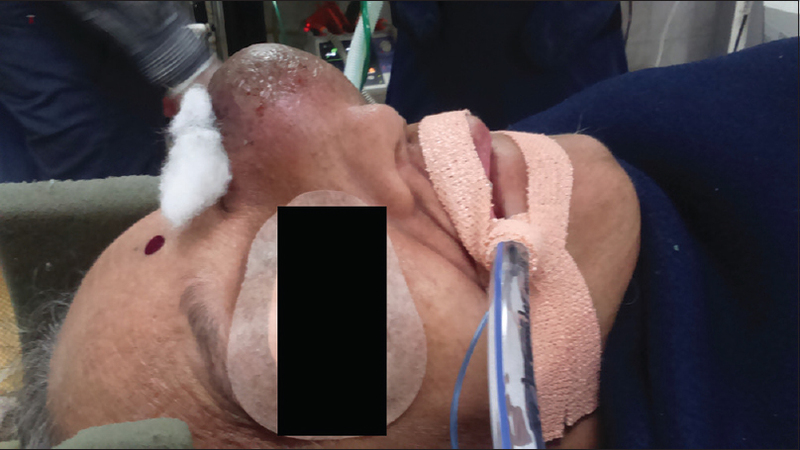 We report a case of a 65-year-old lady who presented with a large AV malformation of the face located around the nasal bride and alae nasae posted for coiling under general anesthesia. Anesthetic management of the case was a challenge as it was an anticipated difficult airway situation. Furthermore, any pressure on the swelling can lead to rupture and hemorrhage as the skin above swelling was unhealthy. There was difficulty in mask ventilation both with larger- and smaller-sized facial masks including Rendell-Baker-Soucek mask. Supraglottic airway device had to be inserted as a rescue measure. 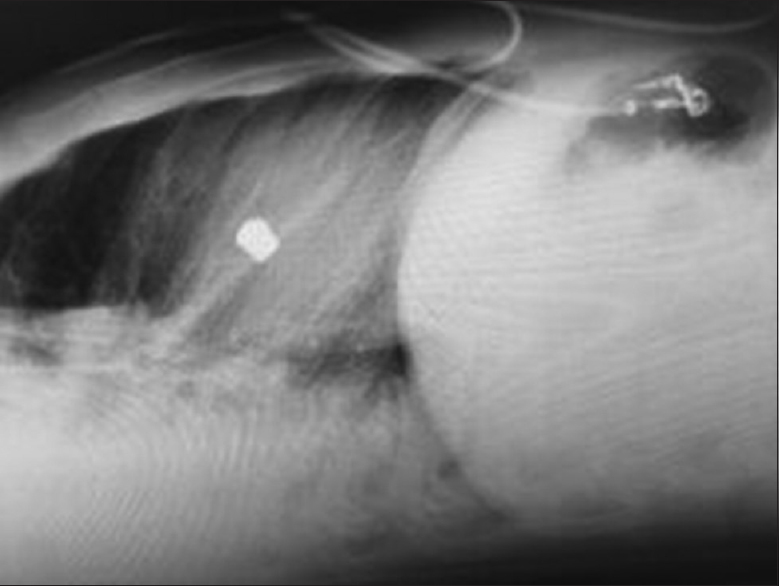 After getting effective ventilation, muscle relaxants were supplemented, and trachea was intubated. While intubating the axis of the laryngoscope had to be maintained on the right side to avoid pressure on the swelling as it could traumatize the malformation. The procedure went on uneventful. The patient was extubated fully awake. Oral and maxillofacial surgeries associated with complications due to endotracheal tube (ETT) damage are being reported in literature increasingly. 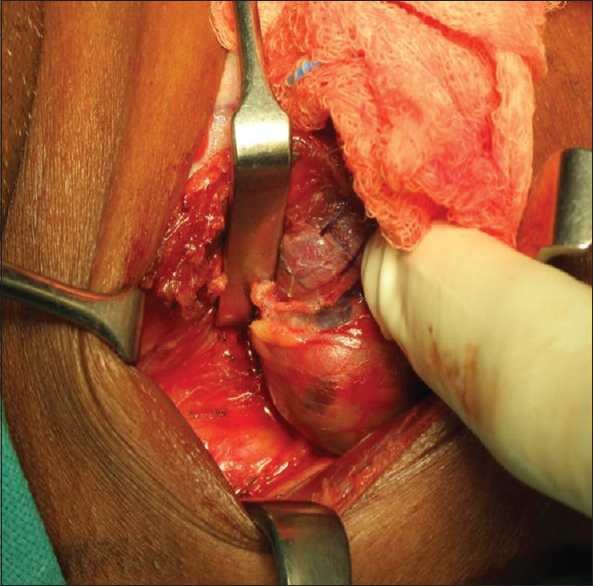 In this case, we report a rare case of accidental perforation of a flexometallic ETT intraoperatively during an orthognathic corrective surgery, in a 19-year-old female patient in whom submental intubation had been performed. The complication was managed conservatively as the tissue debris created during the osteotomy drilling occluded the damage and caused a good seal of the damage, with minimal leak, and no airway compromise. The purpose of this article is to highlight these hazards and discuss alternative airway management approaches so that anesthesiologists can recognize these complications and be prepared to deal with them in a proper manner. Traumatic injuries to the heart contribute significantly to trauma are associated with high mortality. Cardiac gunshot wounds (GSW) are considered more lethal compared to other injuries and present several unique challenges to the anesthesia management and perioperative care. We are reporting a rare case of a trauma victim who survived a GSW to the heart. We will discuss the perioperative care of penetrating cardiac injuries, the role of the anesthesia team in resuscitation, safe anesthesia induction, cardiopulmonary bypass management, and the essential role of intraoperative transesophageal echocardiogram imaging. Some surgical procedures performed under moderate and sometimes extreme positions expose patients to nonphysiological changes. Especially, the manipulations of a patient in prone and lateral decubitus position might increase complications. Anesthesia mumps has been reported as one of these complications. It has been found to be rare but known entity associated with patients of all age groups and all surgical positions. 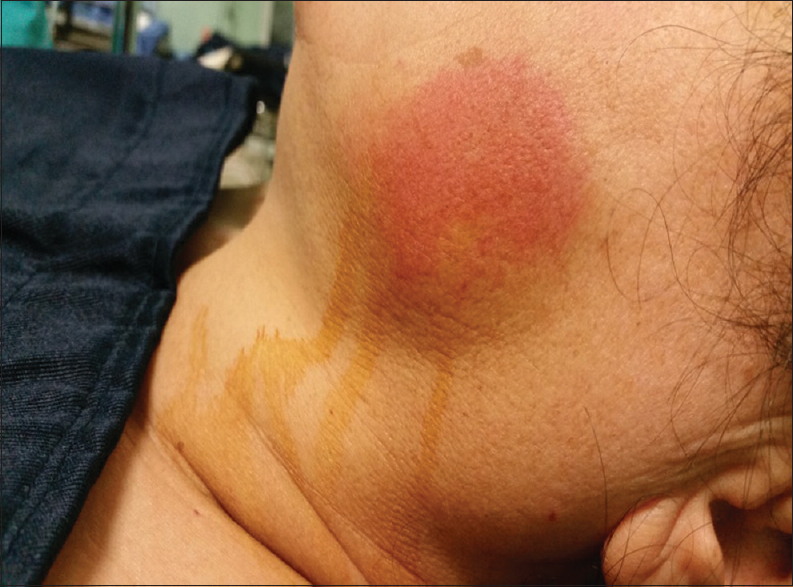 We herein describe an early noticed acute case of unilateral anesthesia mumps that developed after endotracheal intubation in prone position in a 54-year-old female. Anesthesia mumps may occur in the immediate postoperative period with no suspicious predisposing factor. The reports of such cases would increase the awareness among anesthesiologists and postoperative caregivers regarding this benign complication. 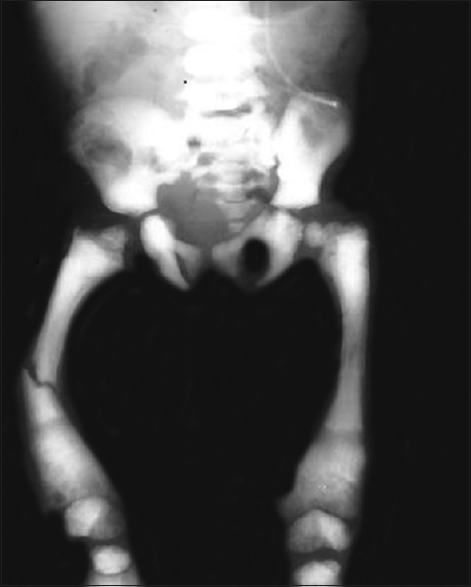 Osteopetrosis is a rare genetic disorder of osteoclast dysfunction leading to anatomical and physiological disorders. We present the anesthesia management for the femur fracture of a 4-year-old girl with malignant infantile type of osteopetrosis. She had a ventriculoperitoneal shunt, impaired motion, visual disturbance, growth failure, facial deformity, heart murmur of moderate tricuspid regurgitation, and left ventricular heart failure, with splenomegaly and severe anemia.